1. 절대적응증에 대해서는 큰 논란이 없습니다. 절대적응증 (absolute indication) 병소의 내시경 치료에 대해서는 누구나 동의하고 있습니다. 데이타도 상당수 누적되어 있고 모든 가이드라인에서 통일되게 권고되고 있습니다. 절대적응증에 대한 내시경치료가 언급된 최초의 영문 가이드라인은 2002년 발표되었습니다 (Nakajima. 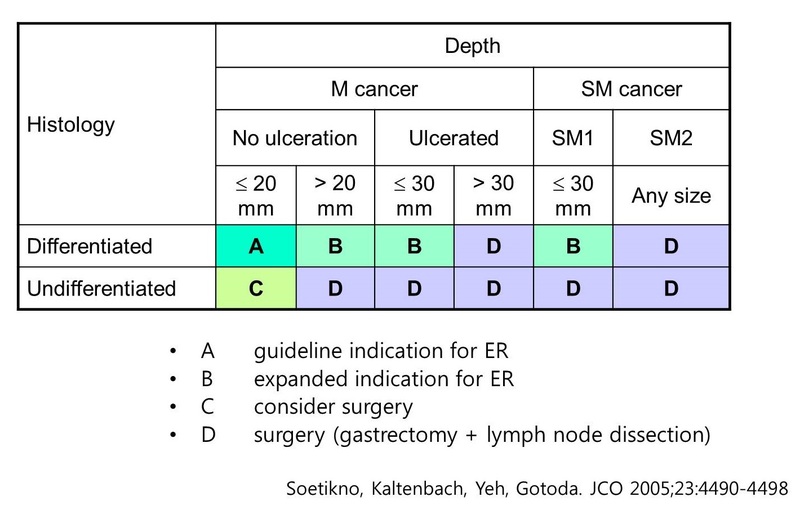 Gastric Cancer 2002;5:1). 절대적응증 병소의 내시경 치료 결과가 단독으로 보고되는 경우는 거의 없습니다. 치료 전 절대적응증으로 판단하였으나 치료 후 크기 등 기준에 의해 expanded criteria에 해당하는 증례가 나오기 때문입니다. 따라서 절대적응증과 확대적응증 자료를 모아 함께 발표하는 것이 보통입니다. 삼성서울병원에서 발표한 '내시경 치료 후 병리결과에서 curative resection으로 판정된 1,450명에 대한 추적관찰 성적'이 전형적인 예입니다 (Min BH, et al. Endoscopy - in press). 2015년 국립암센터 위암팀의 보고입니다 (Choi IJ. GIE. 2015). 멋진 연구이고 멋진 결론입니다. 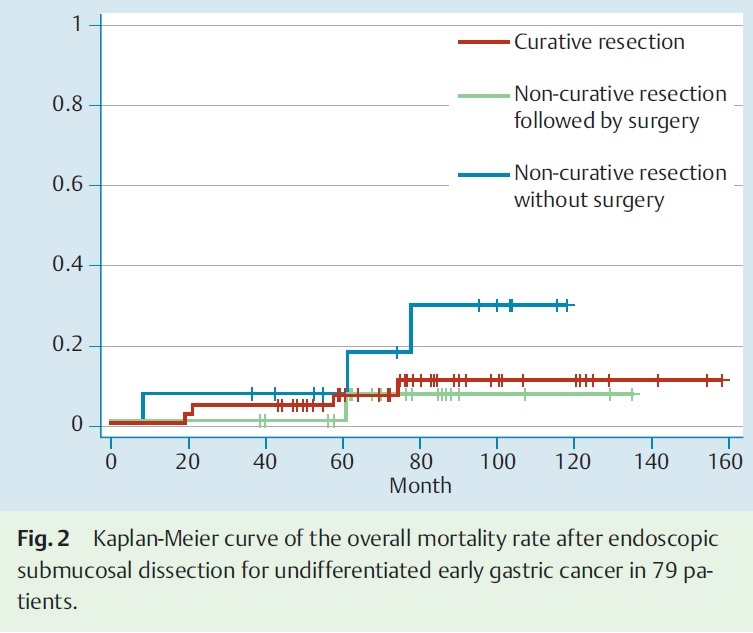 "The OS rate after ER for mucosal gastric cancer that met the absolute indication was comparable to that achieved with surgery. 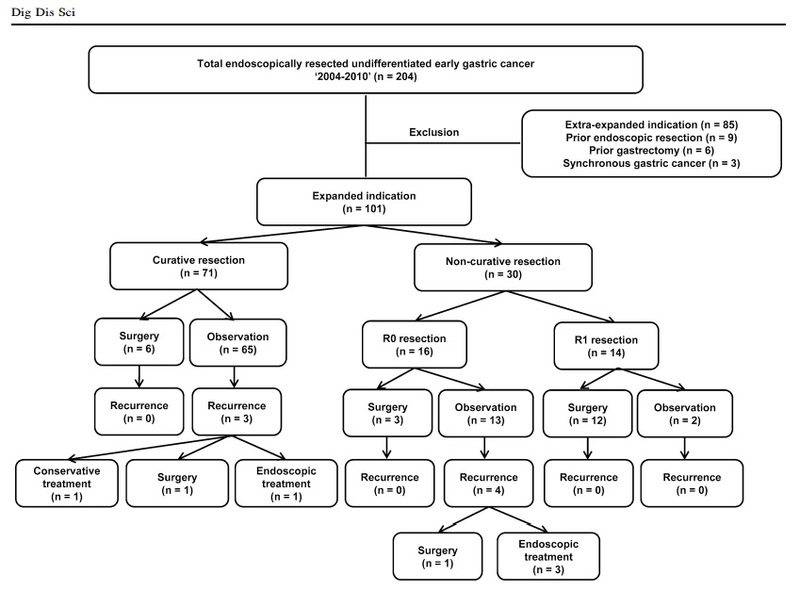 Although metachronous cancers were more common after ER, they were usually treatable and did not affect survival." 확대적응증 (expanded indication)에 undifferentiated-type이 포함되는가는 무척 헷갈리는 이슈입니다. 처음 제안될 때에는 포함되어 있었는데, 중간에 JCO 논문에서는 잠시 빠졌다가, 한국과 일본의 가이드라인에는 포함되었습니다. 대부분의 논문에는 포함되어 있지 않으나 일부 논문은 포함시키기도 합니다. 헷갈리시지요? 아래를 찬찬히 읽어보시기 바랍니다. 먼저 역사부터 살펴보겠습니다. 1990년대부터 확대적응증을 언급한 작은 연구들이 있었습니다. 그러나, 확대적응증에 대한 논의가 본격화 된 것은 위암이 많았던 두 병원(동경암센터와 동경암연구회병원)의 수술 후 림프절 전이 위험 분석을 바탕으로 한 2000년 Dr. Gotoda의 제안(Gastric Cancer 2010;3:219)이 계기가 되었습니다. 여기에는 undifferentiated-type이 포함되어 있습니다. Dr. Gotoda는 이후 확대적응증에 대한 몇 번의 기고에서 계속 undifferentiated type을 포함시켰습니다. 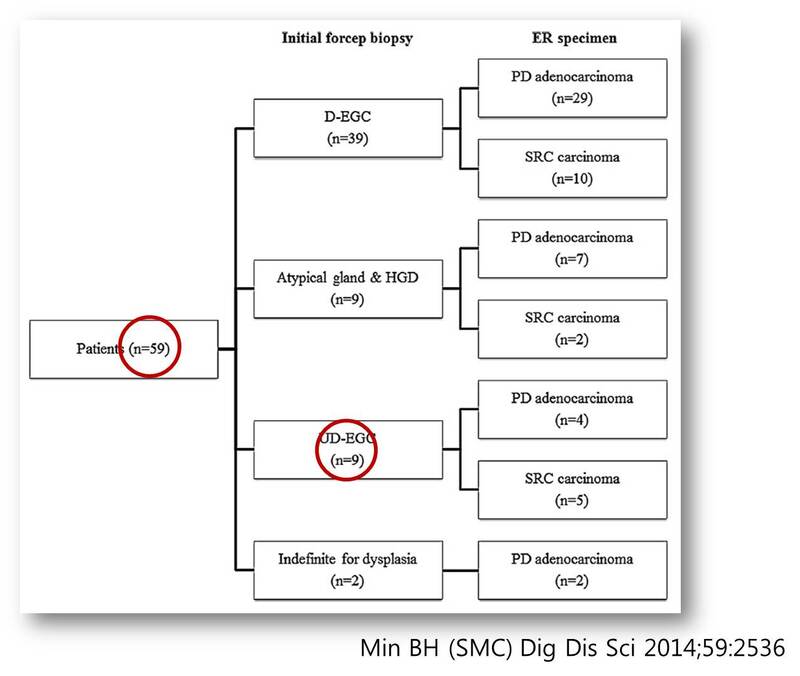 그런데 확대적응증에 undifferentiated-type이 포함되는가에 대한 혼란이 생긴 것은 Journal of Clinical Oncology라는 유명한 잡지에 Dr. Gotoda가 Roy Soetikno와 함께 아래와 같은 Table을 발표하였기 때문입니다. 여기서는 undifferentiated-type은 group C로 분류하여 수술이 권유되었습니다. 즉 확대적응증에서 빠진 것이지요. 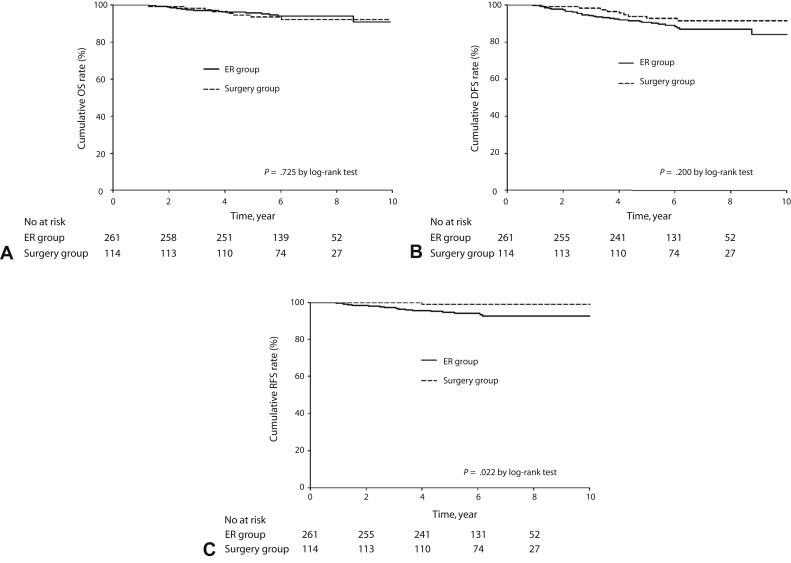 확대적응증이라는 title로 발표되고 있는 많은 논문들은 Journal of Clinical Oncology의 Table과 같이 undifferentiated-type을 뺀 증례만을 다루고 있습니다. 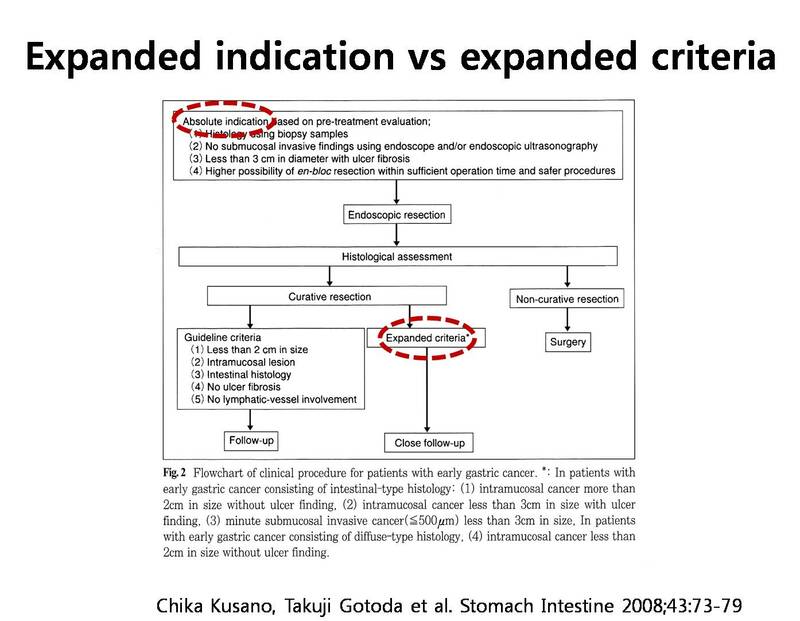 심지어는 Dr. Gotoda 본인이 발표한 2010년 British Journal of Surgery 논문도 undifferentiated-type을 포함시키지 않고 있습니다. Dr. Gotoda는 확대적응증에 대해서 혼자 이야기 할 때에는 undifferentiated-type을 포함시켰지만, 미국 의사들과 JCO 논문을 쓸 때나 자신의 data를 발표할 때에는 undifferentiated-type을 포함시키지 않았습니다. 주장은 하지만 스스로 확신하지 못하고 있는 것 아닌가 추정됩니다. 대가조차 이처럼 흔들리고 있기 때문에 다른 많은 의사들도 따라서 흔들리고 헷갈리는 것입니다. 3. 한국, 일본, 유럽 가이드라인에서는 확대적응증에 undifferentiated-type이 포함되어 있습니다. 가이드라인에서는 일본이나 우리나라나 모두 확대적응증에 undifferentiated-type을 포함시키고 있습니다. 2010년 일본 가이드라인에서는 확대적응증을 investigational treatment로 의미를 축소하면서 현실과 타협하고 있는 모양세입니다. 2014년 우리나라 가이드라인에서는 매우 간단히 다뤄지고 있는데, 심평원 보험 급여 기준에는 포함되지 않고 있어서 현실적으로 undifferentited-type에 대하여 ESD를 시행하기는 무척 어렵습니다. 저는 거의 안 하고 있습니다. 2015년 9월에 발표된 유럽 ESD 가이드라인에서는 한국이나 일본과 마찬가지로 확대적응증에 undifferentiated-type을 포함시키고 있습니다. Expanded indication이라는 제목으로 발표되는 연구는 heterogenous합니다. Undifferentiated-type이 포함되지 않은 것이 더 많습니다. 간혹 포함된 것도 있습니다. 논문을 아주 자세히 읽지 않으면 알기 어렵게 되어 있습니다. 최근 나온 metaanalysis에서도 이런 점을 놓쳤더군요. 2009년 동경대학교 논문입니다 (Goto. 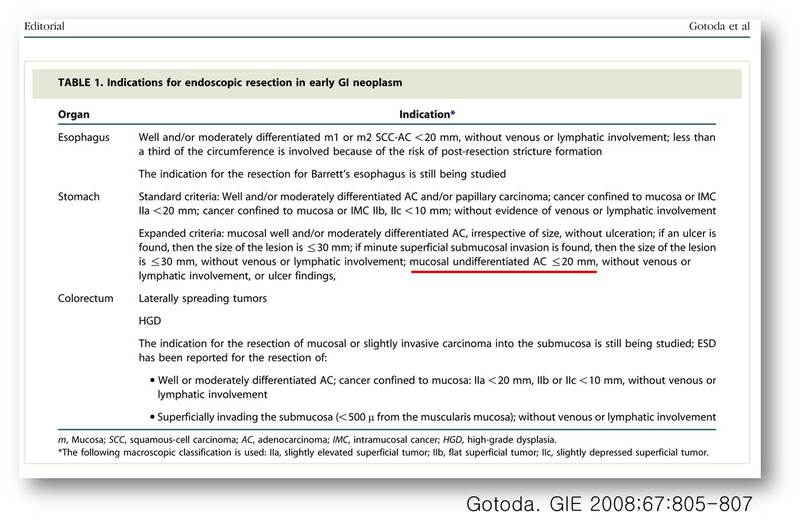 Endoscopy 2009). Undifferentiated-type은 빠졌습니다. 일본에서 나오는 확대적응증 논문에는 거의 항상 undifferentiated-type은 빠져 있습니다. 2010년 일본 국립암센터 동경병원 논문입니다 (Gotoda. Br J Surg 2010). 유명한 Gotoda 선생이 첫 저자입니다. Diffuse type은 noncurative resection으로 간주하여 제외시킨 논문입니다. 즉 undifferentiated-type은 빠진 data입니다. 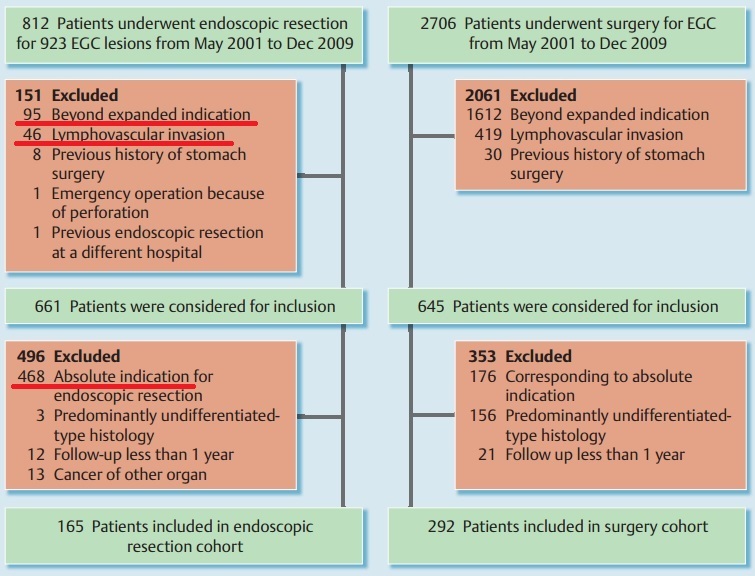 2011년 삼성서울병원의 논문입니다 (Lee H. Surg Endosc 2011). Undifferentiated-type은 빠진 논문입니다. 2011년 아산 병원 논문입니다 (Ahn JY. GIE 2011). Undifferentiated-type은 빠진 논문입니다. 1,619개의 조기위암을 내시경치료 하여 absolute indication 852개 (52.6%), expanded indication 518개 (32.0%), beyond expanded indication 249개 (15.4%)였습니다. 2013년 부산대학교 병원 논문입니다 (Choi MK. 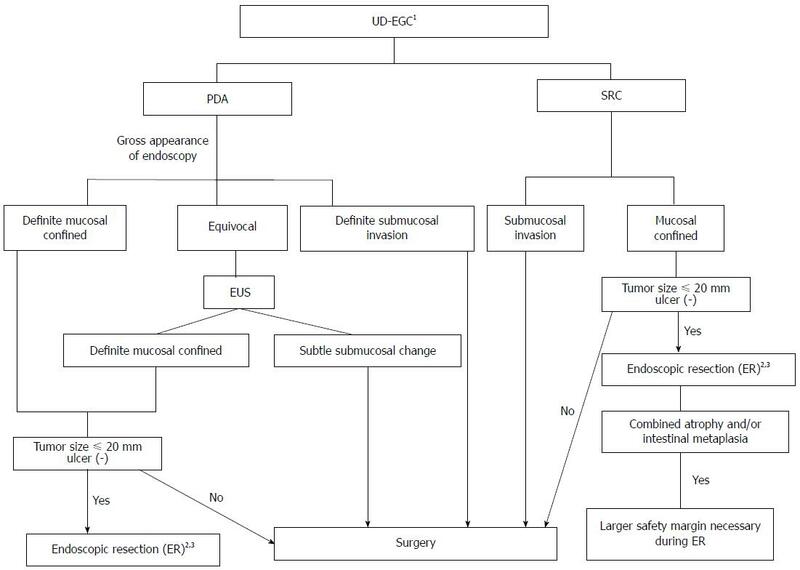 Surg Endosc 2013). 마찬가지로 Undifferentiated-type은 빠진 논문입니다. 2015년 일산 국립암센터 위암팀에서 발표한 멋진 논문입니다 (Kim YI. 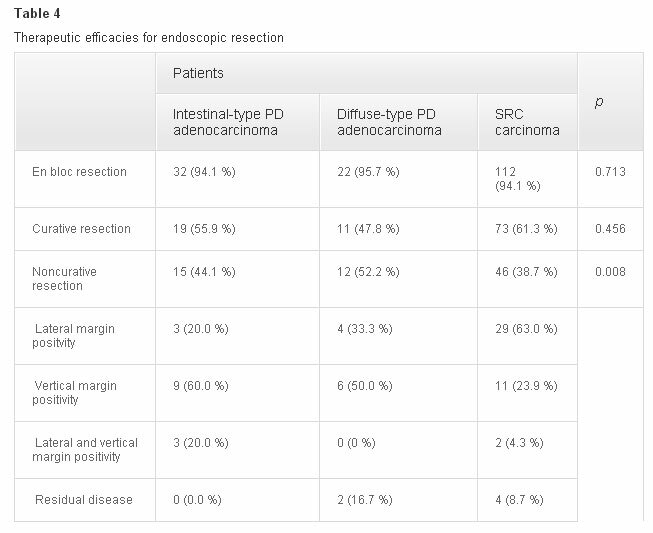 Endoscopy 2015). 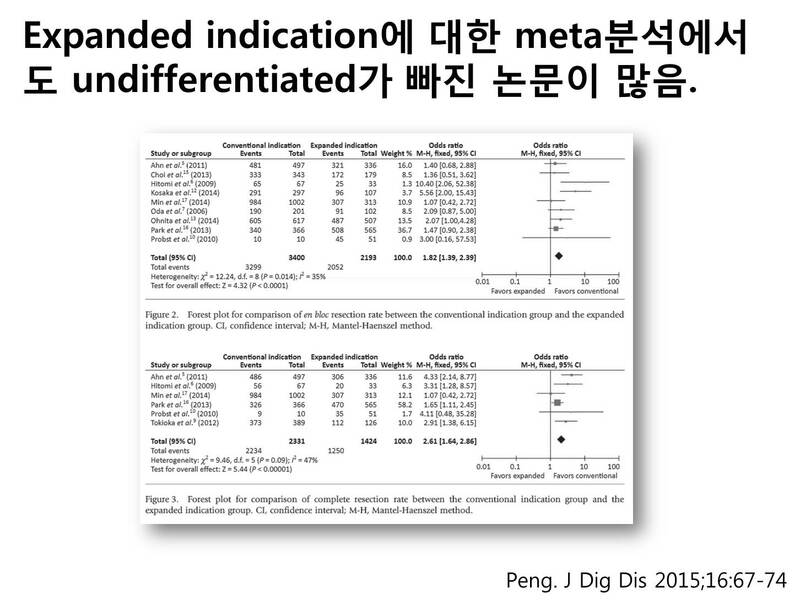 Method에서 expanded indication을 설명했는데 undifferentiated-type은 빠졌습니다. 위암 수술력이 있는 분, 타장기 암, 1년 이하 추적관찰, predominantly undifferentiated-type 등을 뺀 환자는 774명입니다. 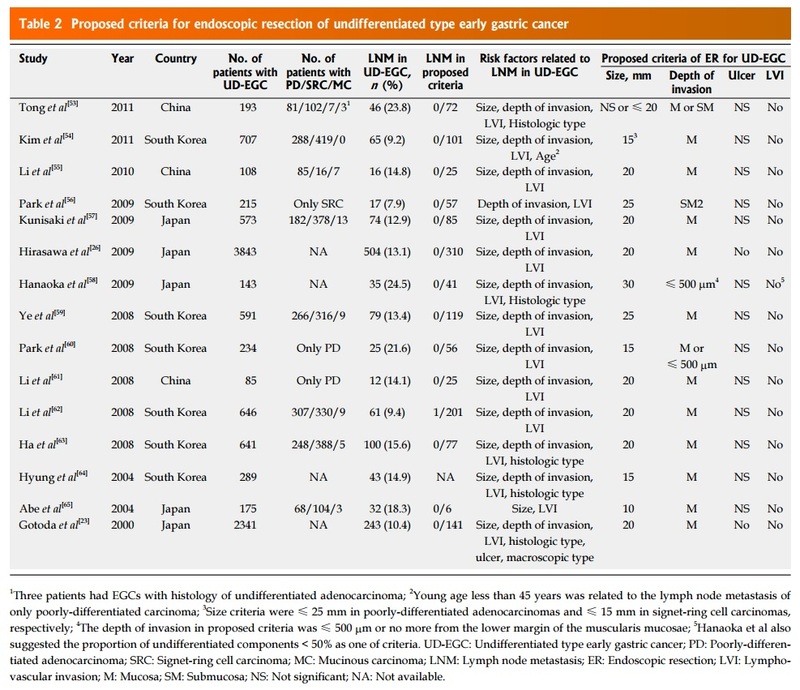 그 중 lymphovascular invasion 46명은 어디에 속하는지 알 수 없어서 또 제외하면 728명입니다. 결국 728명을 내시경으로 치료하였는데 absolute indication이 468명 (64.3%), expanded indication이 165 (22.7%), beyond expanded indication이 95 (13.0%)라는 결과입니다. 즉 100명을 ESD 하면 13명은 수술해야 한다는 결과인데 이는 삼성서울병원의 자료와 비슷한 수치입니다. ESD candidate를 상당히 보수적으로 잡을 때 나오는 결과인 것으로 생각됩니다. [메타분석] 중국에서 나온 metaanalysis입니다. 그런데 엉망진창입니다. Expanded indication이 아닌 논문도 포함되어 있으며, undifferentiated가 포함되었는지 아닌지는 아예 고려되어 있지 않습니다. 2010년 순천향 대학교 논문입니다 (Lee TH. GIE 2010). Diffuse type이 포함되어 있습니다. Undifferentiate-type과 거의 비슷합니다. 2011년 12월 충남대학교 논문입니다 (Goh PG. 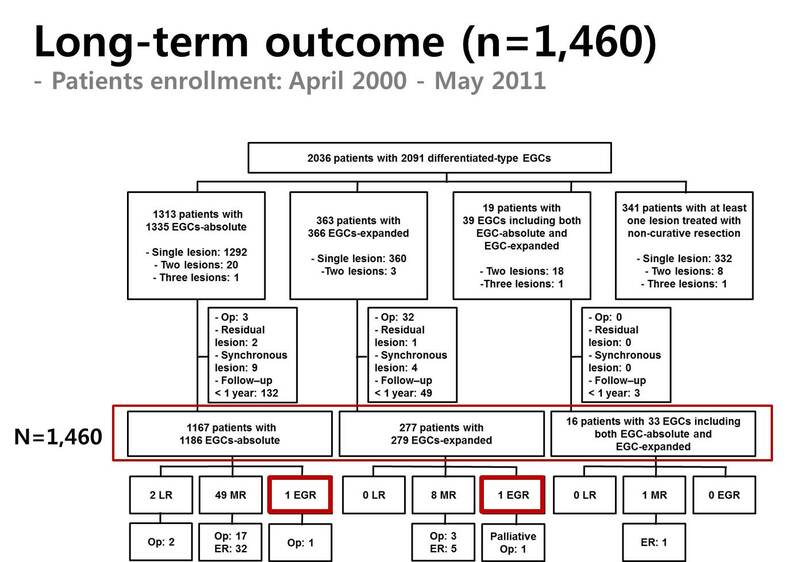 Clin Endosc 2011). 5년간 ESD한 모든 증례에 대한 분석입니다. Undifferentiated-type도 포함되어 있으나 절대적응증, 확대적응증으로 엄밀히 subgroup되어 분석되지는 않았습니다. Undifferentiated-type 중 약 절반은 시술 전에는 differentiated type으로 분류되었다는 것을 밝힌 솔직한 논문입니다. 이런 논문은 많지 않습니다. [Very important] 2013년 연세대학교 논문입니다 (Park CH. Digest Liver Dis 2013). Undifferentiated-type이 포함되어 있습니다. 연세대학교 논문에 포함되어 있는 매우 중요한 자료입니다. 확대적응증에 해당하는 것 사이에 차이가 있다는 분석입니다. 같은 확대적응증이라고 하더라도 differentiated-type과 undifferentiated-type은 확연히 차이가 있습니다. 2014년 일본 Nagasaki 대학의 솔직한 연구입니다 (Onita K. Exp Ther Med 2014). 1,332명 중 absolute indication은 46.3%, Expanded indication은 38.1%, Beyond expanded indication은 15.6%였습니다. Expanded indication 중 undifferentiated-type는 딱 6예 (1.2%, 6/507) 뿐이었습니다. 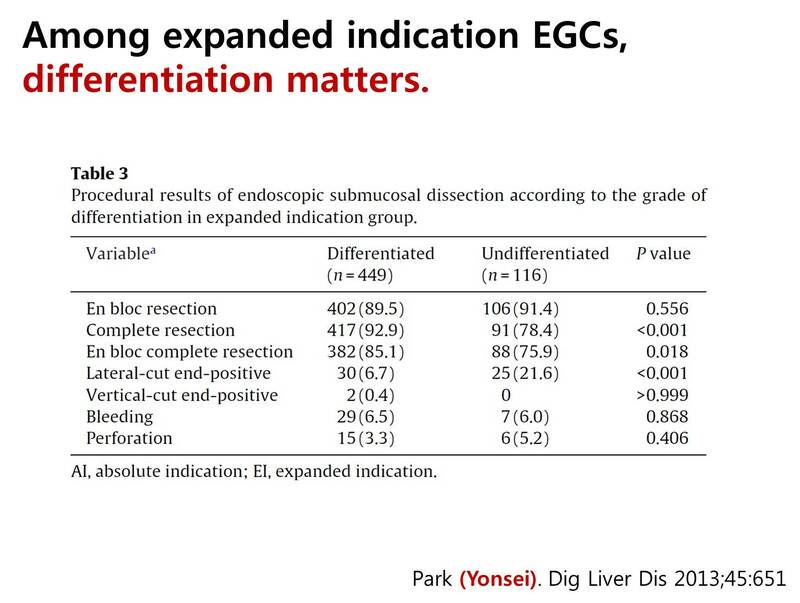 ESD candidate를 정할 때 undifferentiated-type은 포함하지 않는 모양입니다. 2014년 3월 일본 동경암센터의 Oda 선생님이 Preliminary results of multicenter questionnaire study를 발표하셨습니다 (Oda. Dig Endosc. 2014). 6개 major center의 자료를 모은 것입니다. 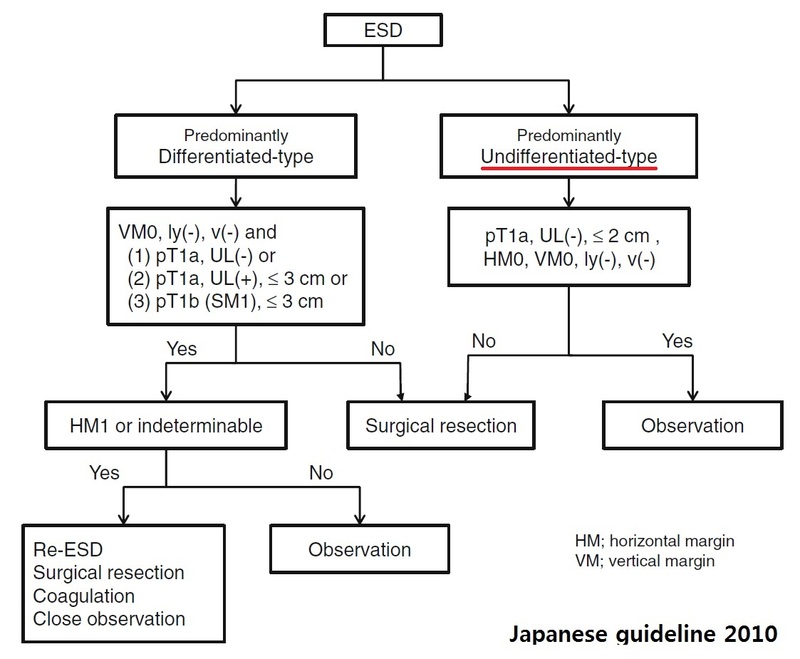 2015년 대구 경북지방의 다기관 연구인데 undifferentiated-type이 포함되어 있습니다 (Shin KY. Gut Liver 2015). 그런데 beyond expanded indication이 한 증례도 없다고 되어 있어서 selection bias가 있는 논문입니다. 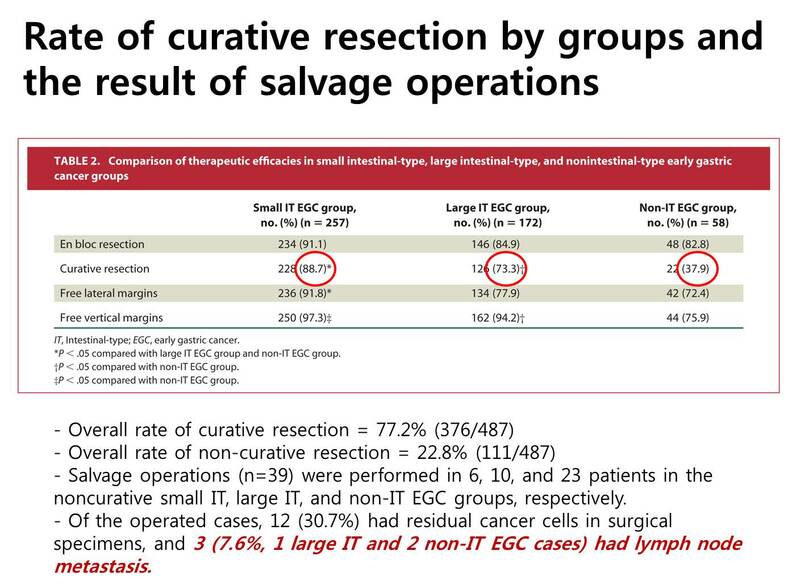 이러한 이유로 curative resection rate가 너무 좋습니다. 다른 연구와 비교가 되지 않을 정도로 좋습니다. 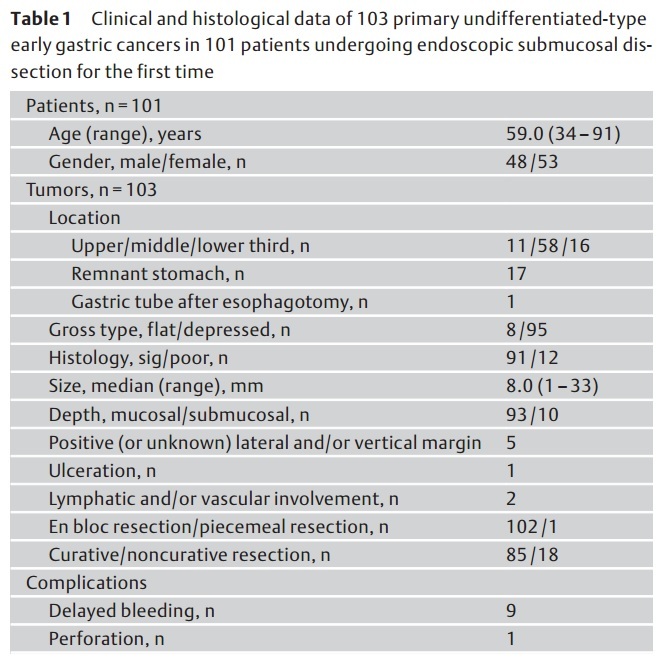 2015년 서울대학교 병원의 연구입니다 (Choi J. Surg Endosc 2015). Undifferentiated type이 섞여있습니다. 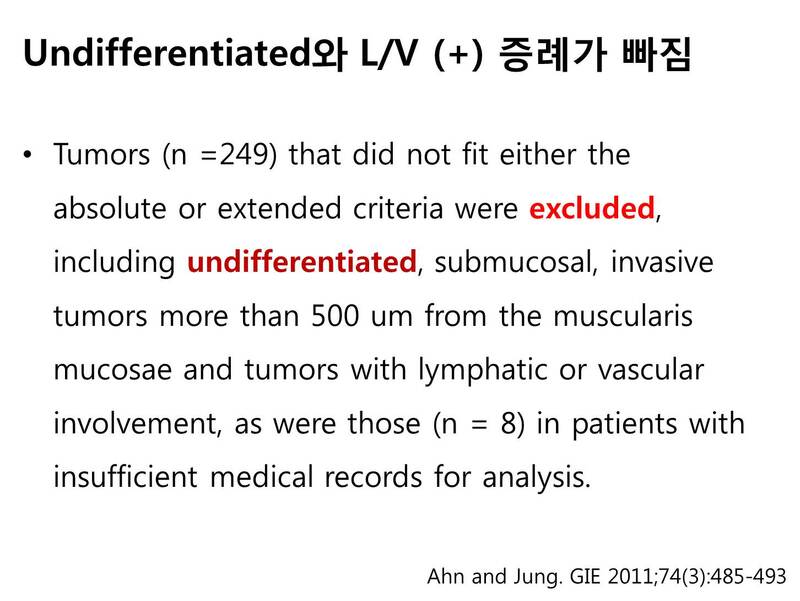 Undifferentiated-type은 전체 expanded indication criteria 중 13.8% (48/348)뿐입니다. Beyond expanded indication 즉, 최소한 수술이 필요한 환자 중 41.7% (60/144)만 수술을 받았다는 점이 아쉽습니다. 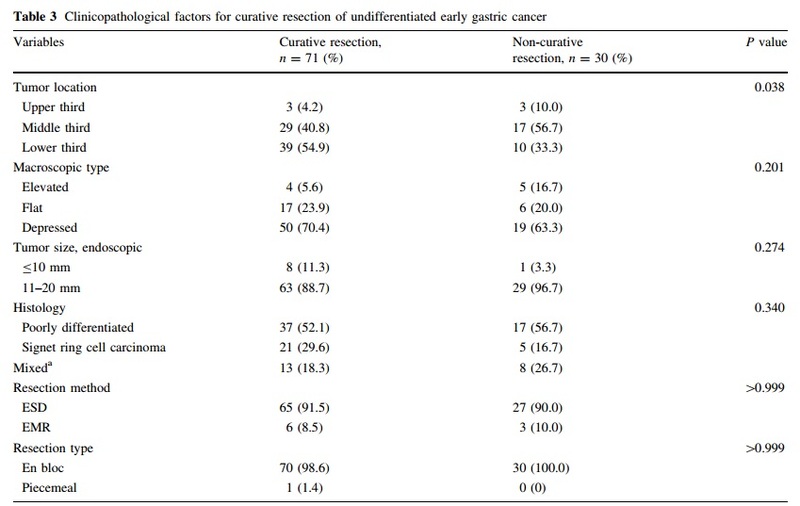 2015년 동경암센터 연구입니다 (Suzuki H. Gastric Cancer 2015 - Epub). Undifferentiated type만 따로 분석한 논문은 많습니다. 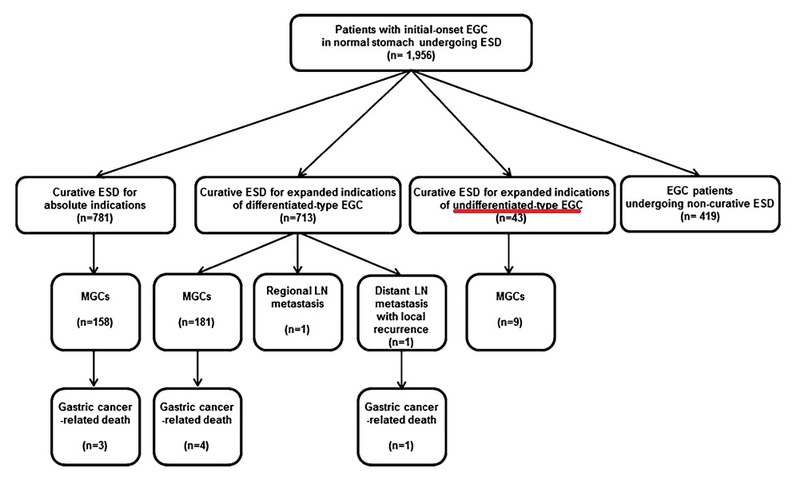 쿄토 적십자병원 논문은 제목을 솔직하게 'ESD for undifferentiated early gastric cancer as the expanded indication lesion'으로 붙여서 undifferentiated-type과 확대적응증과의 관계를 명확히 밝히기도 하였습니다 (Kadama. Digestion 2012). 용어에 대한 혼선을 명확히 정리한 좋은 예라고 생각합니다. 1) 2009년과 연세대학교 자료입니다 (Kim JH. GIE. 2009). 연세대학교에서는 2014년 Surg Endosc에 보다 많은 환자의 추적관찰 결과를 발표하였습니다. 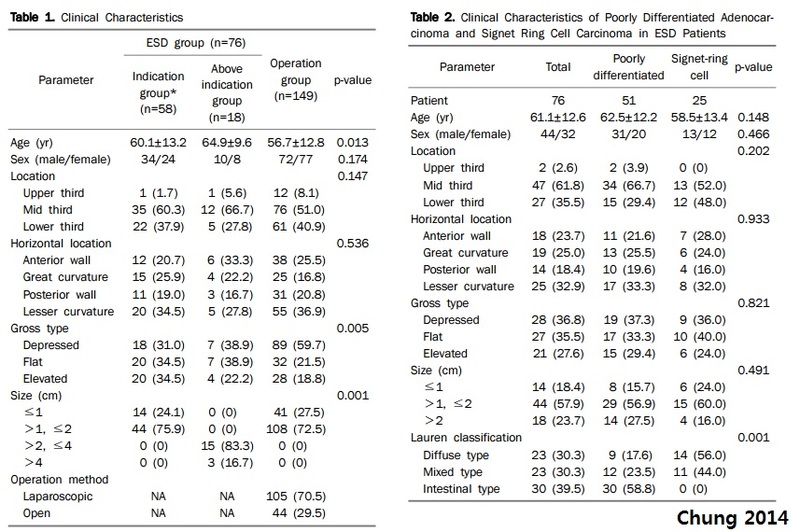 연세대학교에서는 2014년 signet ring cell carcinoma만 따로 모아 발표하기도 하였습니다 (Kim MN. DLD 2014). 평균 나이 55세, Mean tumor size 12mm의 signet ring cell carcinoma 126예를 ESD 하였는데 complete resection은 81예(64.3%)였습니다. 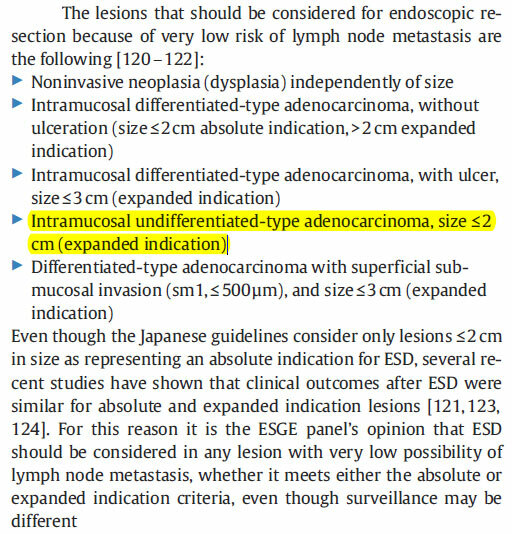 Size underestimation된 경우(=작다고 생각하여 ESD 하였는데 실제로는 작지 않은 예)에서 incomplete resection이 많았다고 합니다. 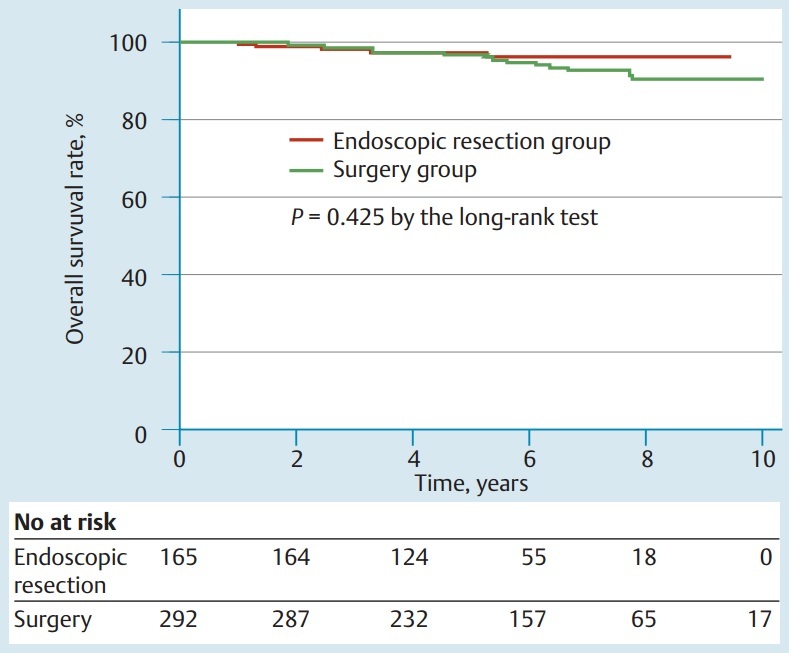 Incomplete resection 45예 중 33예는 수술을 받았습니다 (73.3%). 저는 수술받지 않은 12예(26.7%)가 다소 걱정스러웠습니다. 3) 2010년 일본 암연구회 병원의 연구입니다 (Yamamoto. Dig Endosc. 2010). 치료 전 20 mm 미만의 undifferentiated-type 궤양 없는 점막암을 치료한 결과입니다. 치료 전 undifferentiated-type에 대한 보기 드문 분석입니다. 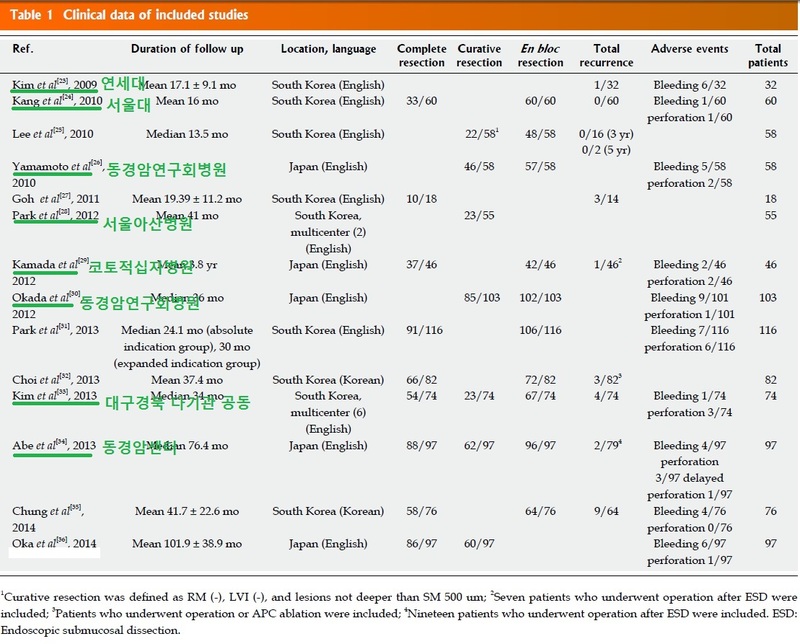 'ESD 자료 분석 기준 시점'은 pretreatment와 posttreatment가 있습니다 (ESD_analysis.html). 이 논문과 같은 pretreatment grouping 기준의 논문은 거의 없습니다. 종양 크기를 5 mm 이내로 맞췄다는 놀라운 결과입니다. 믿어지지가 않습니다. 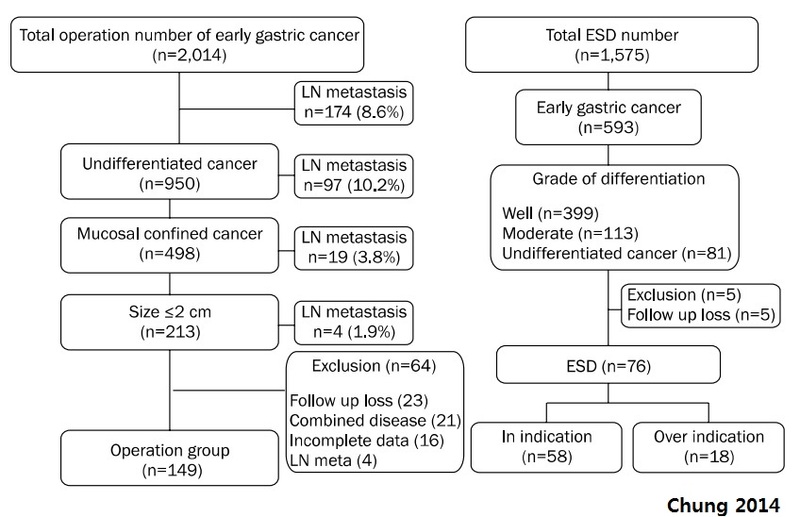 4) 쿄토 적십자병원 논문은 제목을 솔직하게 'ESD for undifferentiated early gastric cancer as the expanded indication lesion'으로 붙여서 undifferentiated-type과 확대적응증과의 관계를 명확히 밝히기도 하였습니다 (Kadama. Digestion 2012). 용어에 대한 혼선을 명확히 정리한 좋은 예라고 생각합니다. 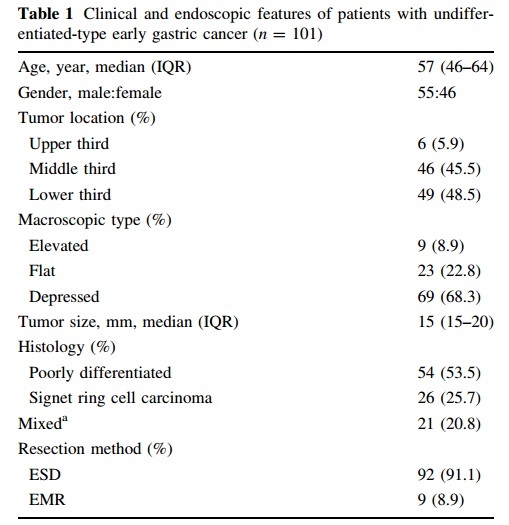 5) 2012년 일본 Cancer Institute Hospital의 작은 논문입니다 (Okada. Endoscopy 2012). Poorly differentiated는 얼마 되지 않고 (11.7%, 12/103), 대부분 signet ring cell carcinoma였습니다. 환자 수는 적지만 일단 curative resection이 되면 재발은 적다고 합니다. 옮깁니다. 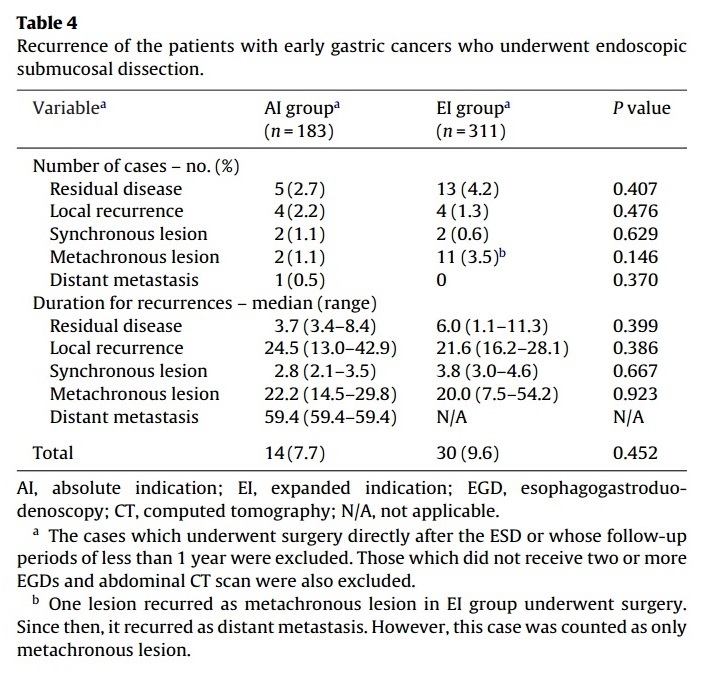 "Among the 78 patients without a past history of malignancy within the previous 5 years in whom curative resection of the primary lesion was achieved, no cases of local recurrence or distant metastasis were observed during follow-up"
6) 2012년 아산병원 논문입니다 (Park. Hepatogastroenterology. 2012). 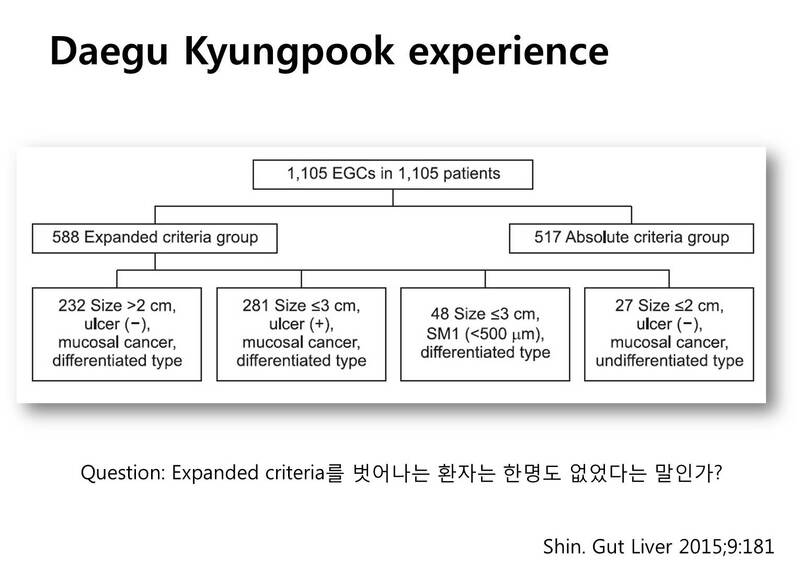 방법에 "diagnosed with undifferentiated EGC after ER"라고 명확히 밝히고 있습니다. 7) 2013년 일본 동경암센터의 매우 솔직한 논문입니다 (Abe. Endoscopy 2013). 조직검사에서 undifferentiated 였는데, ESD를 하여 differentiated로 나온 16명을 제외하였다는 아래 표를 보십시오. 이런 진정성은 드문 일입니다. 저는 이런 종류의 진정성 있는 논문을 좋아합니다. 방법에는 이렇게 씌여 있습니다. 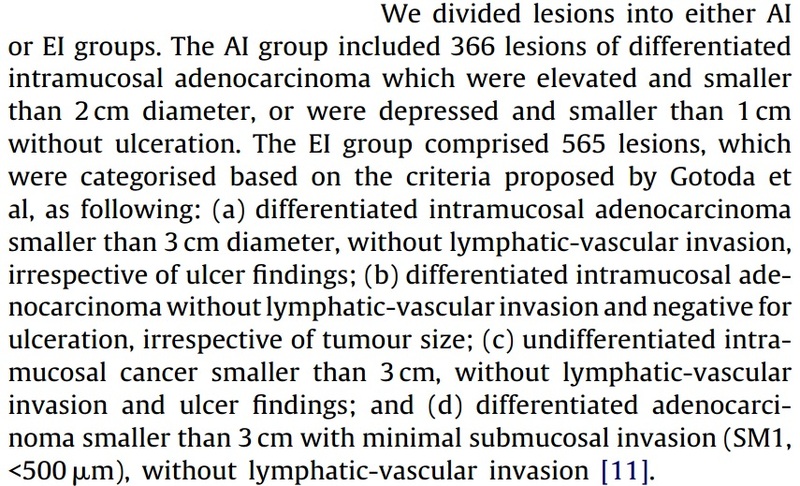 "even if the biopsy showed an admixture of differentiated components - for example, moderately to poorly differentiated adenocarcinoma was included" 한가지 궁금한 것은 시술 전에 differentiated-type이었으나 시술 후에는 undifferentiated-type으로 나온 환자는 없었는가입니다. 논문 어디에서 그런 말은 없는 것 같습니다. 8) 2013년 대구경북지역 다기관 공동연구입니다 (Kim YY. 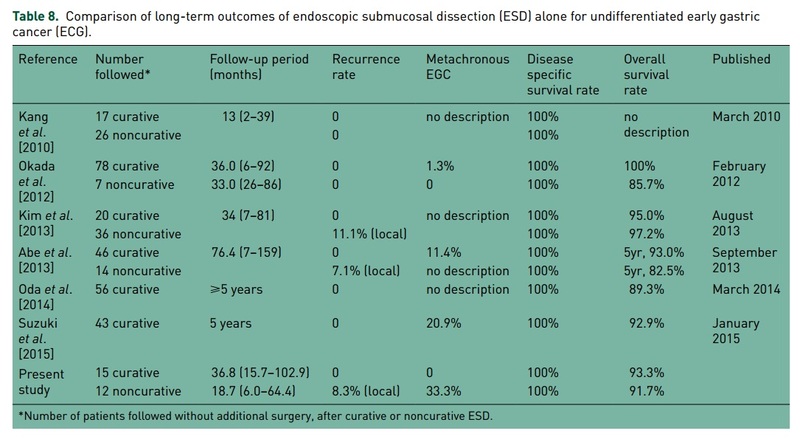 Surg Endosc. 2013). 9) 2013년 4월 순천향대학교 논문입니다 (Choi MH. Korean J Gastroenterol 2013). Undifferentiated-type 중 mixed type이 매우 많았다고 밝히고 있습니다. 10) 2014년 2월 전남대 외과 논문입니다 (Chung. Korean J Gastroenterol 2014). Undifferentiated type에 대한 ESD와 수술을 비교하였습니다. 11) 2014년 2월 일본 히로시마 대학의 매우 섬세한 논문입니다 (Oka. 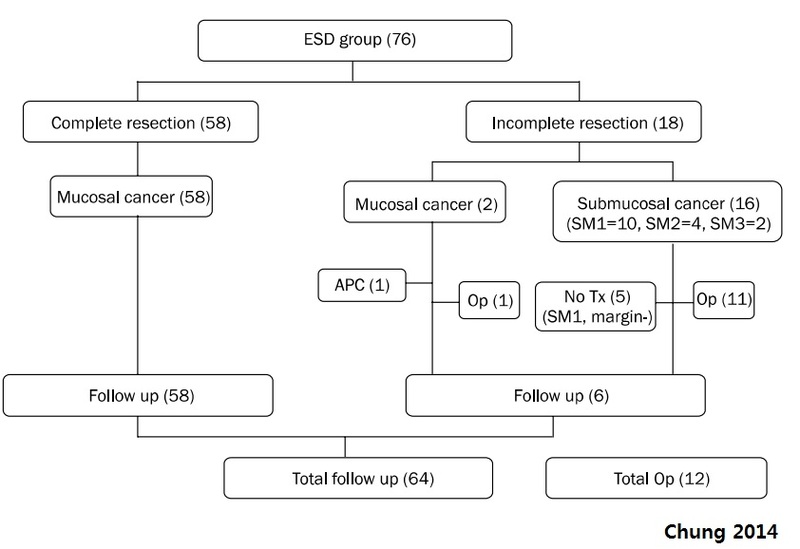 Surg Endosc 2014). 많은 진실이 숨겨져 있습니다. 이 논문 하나로 1시간은 토론할 수 있을 것입니다. 어떤 비밀 데이타가 숨겨져 있는지 한번 찾아보실 것을 권합니다. 12) 2014년 9월 연세대학교의 논문입니다 (Kim JH. Surg Endosc 2014). 13) 2014년 10월 삼성서울병원 자료입니다 (Min. Dig Dis Sci 2014). 약 9년간 2,194명의 ESD를 치료했는데 그 중 치료 후 undifferentiated-type이 59예(2.7%)였습니다. 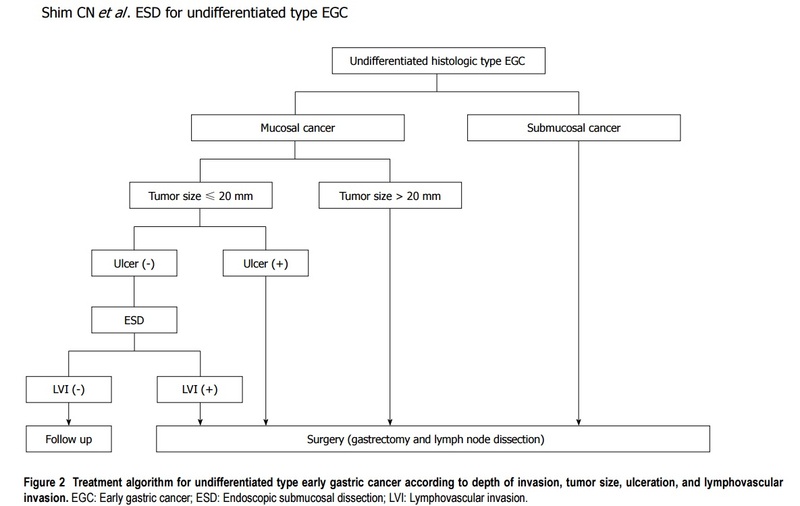 Undifferentiated-type 59예중 50예(84.7%)가 치료 전에는 differentiated-type, atypical gland, indefinite for dysplasia였습니다. 치료 전 조직검사에서도 undifferentiated-type으로 나온 경우는 9예 (15.2%)에 불과하였습니다. Undifferentited-type을 ESD하는 경우가 거의 없는 병원에서 보이는 경향을 대표하다고 할 수 있습니다. Posttreatment 분석에서는 undifferentiated-type이라도 pretreatment 분석을 해보면 differentiated-type이 적지 않다는 점을 강조하였습니다. 치료 전 differentiated-type이 치료 후 undifferentiated-type으로 변경된 경우에 대해서는 ESD_discrepancy.html을 참고하세요. 14) 2015년 4월 일본 Kyushu의 다기관 연구입니다 (Nakamura. Scand J Gastroenterol. 2015). Undifferentiated type이 섞여있습니다. 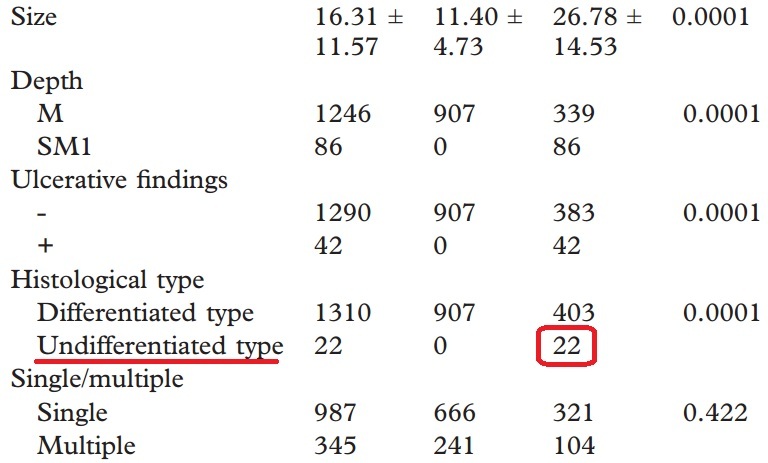 Undifferentiated type은 전체 expanded indication criteria 중 5.2% (22/425)뿐입니다. 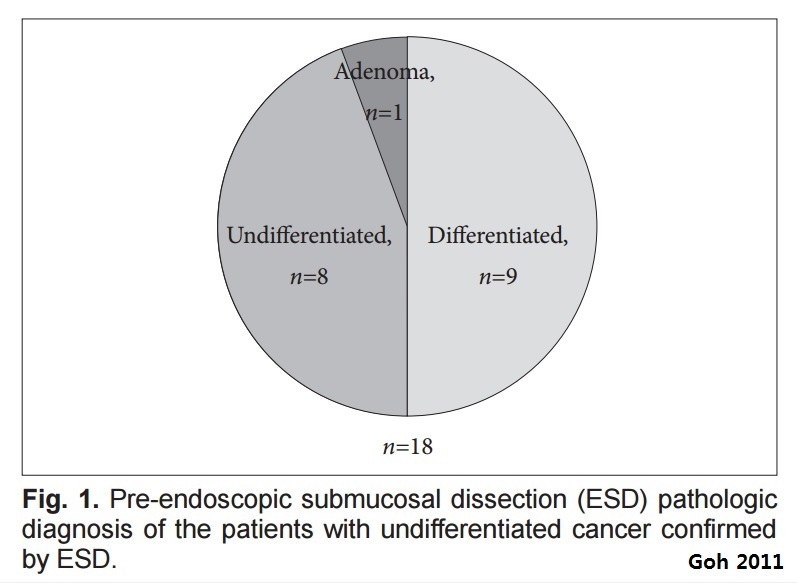 15) 2015년 9월 (Epub) 연세대학교 강남세브란스병원 윤영훈 선생님은 Is the recent WHO histological classification for gastric cancer helpful for application to endoscopic resection?라는 논문에서 undifferentiated-type 209명 중 176명(84.2%)의 자료를 2010 classification에 따라 다시 분석하였습니다. 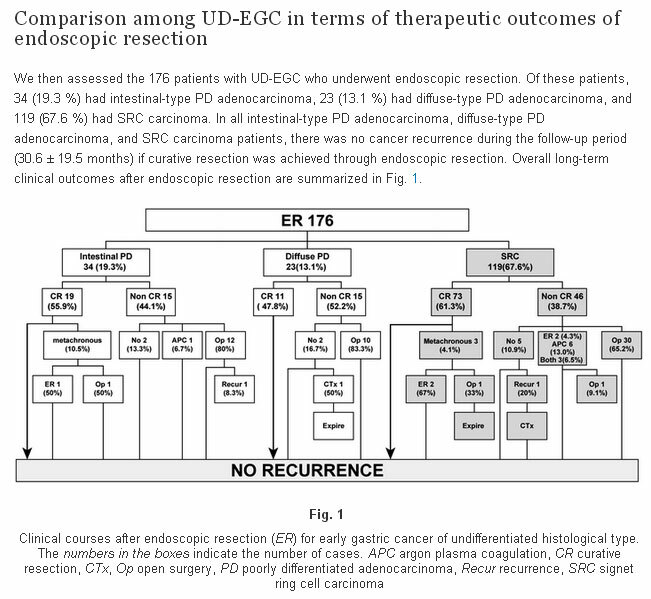 2010 WHO 분류에서 모두 poorly cohesive carcinomas로 간주되는 diffuse-type PD adenocarcinoma와 SRC carcinoma의 양상이 서로 다르다는 결론은 타당하다고 생각합니다. 그런데 몇 가지 질문이 생겼습니다. (1) 이번 논문에서 언급된 209명이 2014년 논문의 209명과 같은 환자인지, (2) 209명의 환자 중 176명을 분석하였는데 남은 33명(15.8%)는 어떤 이유로 제외되었는지, (3) P/D 중 intestinal type의 비율이 높은 편인데 그 이유는 무엇인지 궁금했습니다. 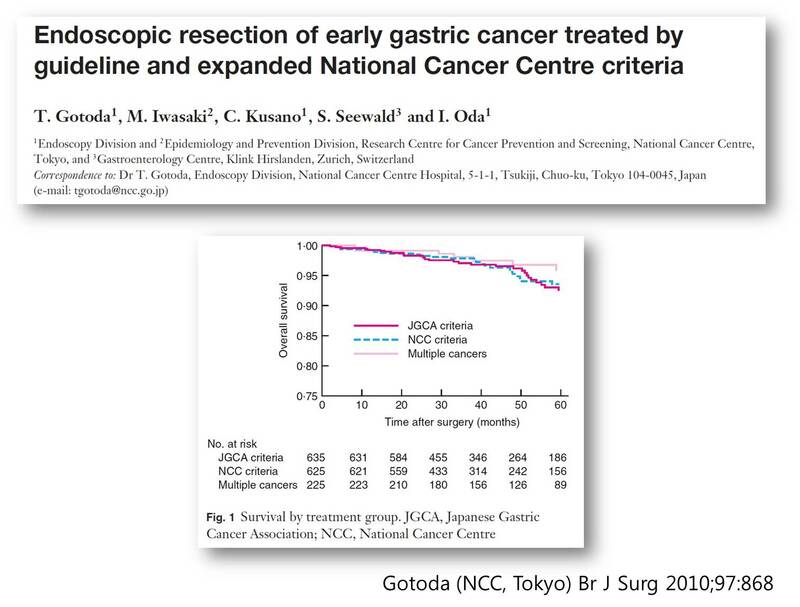 16) 2015년 9월 일본 Yokohama의 Kanagawa Cancer Cancer에서 발표한 작은 규모의 연구입니다 (Inokuchi Y. Therap Adv Gastroenterol). 특별히 새로운 것은 없는데 전체 ESD 중 undifferentiated type이 차지하는 비용에 대한 그림이 흥미로웠습니다. 기존 연구들을 종합한 표를 제시하고 있었습니다. Undifferentiated type 조기위암에 대한 ESD도 candidate 선택을 잘 하면 좋은 결과를 보일 수 있다는 점을 시사하는 자료입니다. 몇 가지 궁금증이 생겼습니다. 1) 204예 중 beyond expanded indication이 85예(41.6%)였다는 점입니다. 이 환자 중 어느 정도가 수술을 받았는지와 수술받지 않은 환자의 장기 성적은 어떠하였는지 궁금했습니다. 2) 204예의 시술 전 조직검사 결과가 어떻하였는지 궁금했습니다. 상당수는 differentiated type 아니었을까 생각해 봅니다. 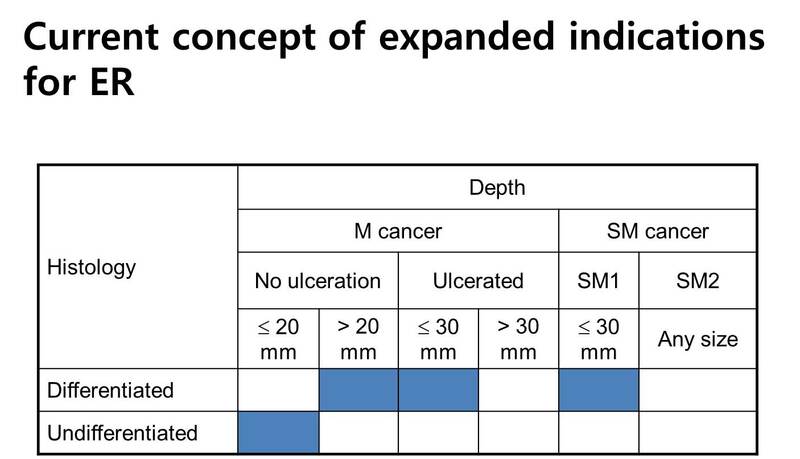 3) Expanded indication이고 수술한 환자와 expanded indication이고 ESD를 한 환자를 비교하면 어떨까 생각해 봅니다. [종설] 2014년 연세대학교의 심충남 선생님께서 1-8번의 논문까지를 모아서 종설을 쓰셨습니다 (Shim CN. WJG. 2014). 심충남 선생님은 그때 까지 나온 8개 논문에 대한 중요한 점을 지적하면서 이렇게 쓰고 있습니다. 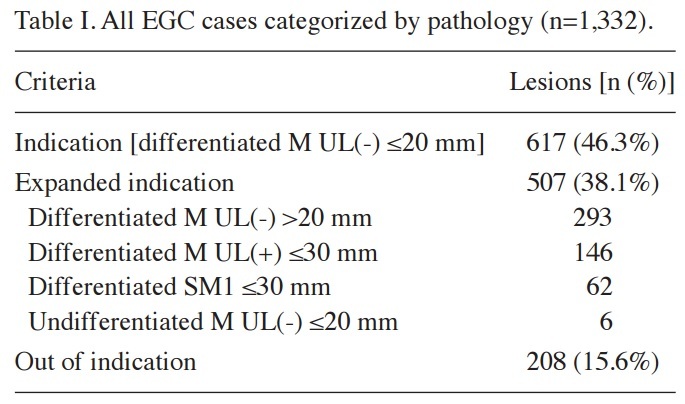 "The overall inaccuracies of assessment of depth of invasion, ulcerative findings, and size of UD-EGC tumors fulfilling the expanded criteria are not negligible, and thus ESD criteria based on endoscopic and histologic findings in UD-EGC should have more restrictions compared to differentiated EGC. (4) inclusion criteria: expanded except 2 studies. - Kim YY. 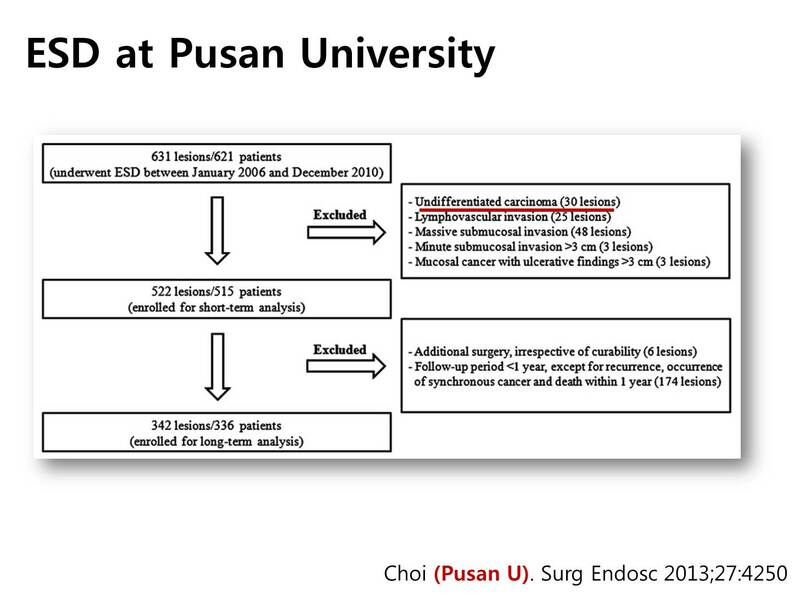 Surg Endosc included patients who refused surgery and were treated by ESD as an experimental treatment and Kang HY. 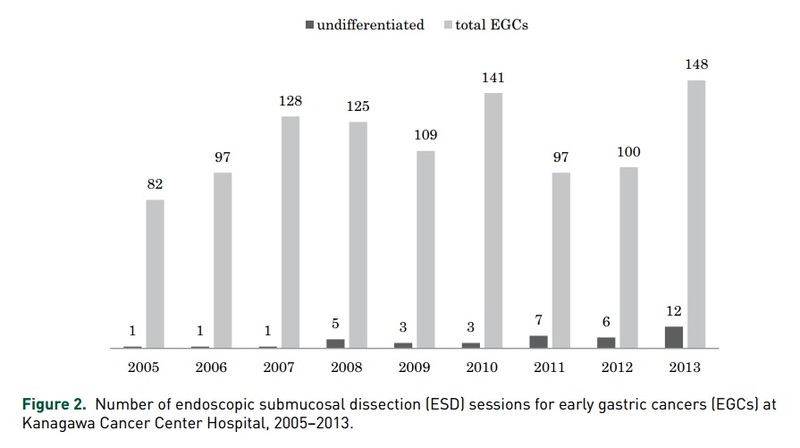 Surg Endosc included patients with UD-EGC with ulceration. 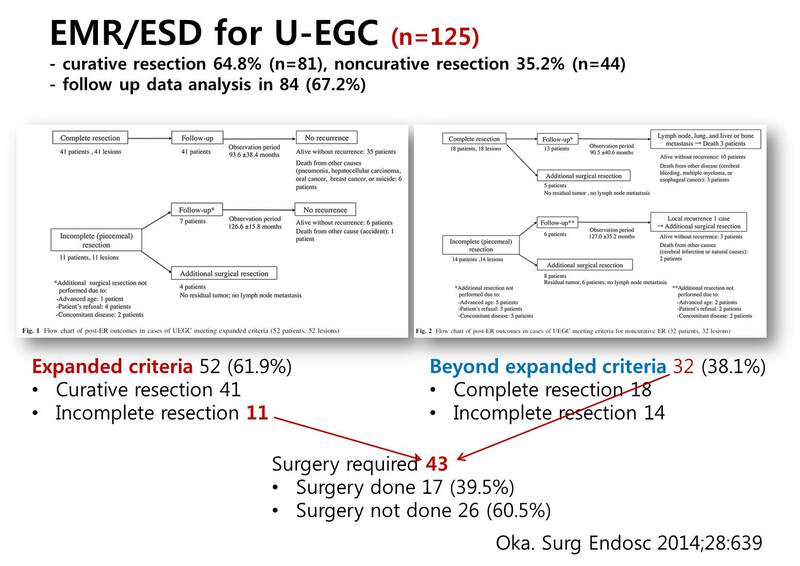 (6) heterogeneous definition of complete resection and curative resection -> The achievement of reasonable curative resection rate in ESD for UD-EGC is critical by means more precisely defining of curable lesions. 마지막으로 심충섭 선생님은 아래와 같은 treatment algorithm을 제시하였습니다. 약간 비현실적이기는 하지만.... 좋은 출발점이라고 생각합니다. [메타분석] 2015년 5월 한림대학교 백광호 교수님 팀에서 meta-analysis를 하였습니다 (Bang CS. World J Gastroenterol. 2015). 14개의 연구(한국 10개, 일본 4개; 2개는 multicenter, 12개 영어, 2개 한국어)가 선정되었습니다. 심충섭 선생님 리뷰에 실렸던 8개 논문은 모두 포함되어 있었습니다 (초록색 밑줄). 심충섭 선생님 종설에 포함되지 않았으나 메타분석에 포함된 논문은 아래와 같습니다. Ref 25. Lee TH. GIE 2010. 순천향대학교 이태희 선생님 논문인데 절대적응증, 확대적응증을 모두 포함시킴. Diffuse type 58예가 언급되어 있음. Ref 27. Goh PG. 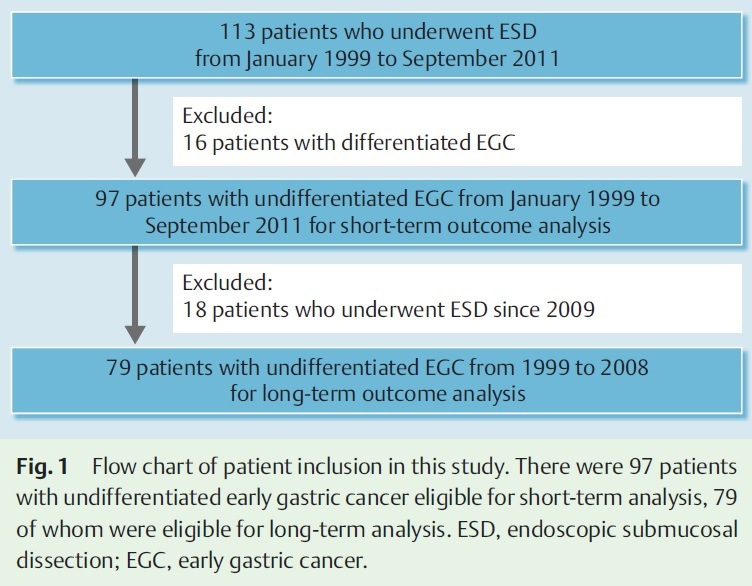 Clin Endosc 2011 충남대학교의 위암 ESD 전체가 포함된 논문임. 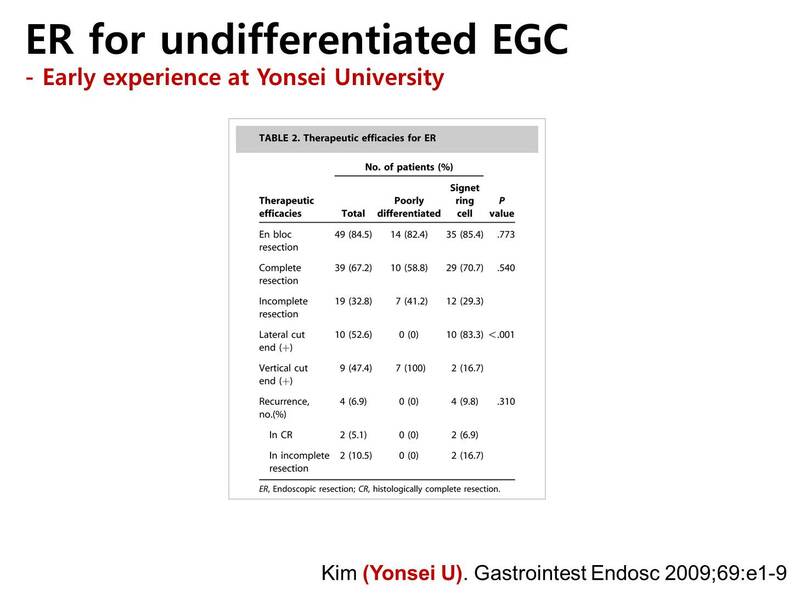 Undifferentiated-typ 18예 중 절반인 9예는 시술 전에는 선종이나 differentiated-type 조기위암으로 분류되었음을 밝히고 있습니다. Ref 31. Park CH. 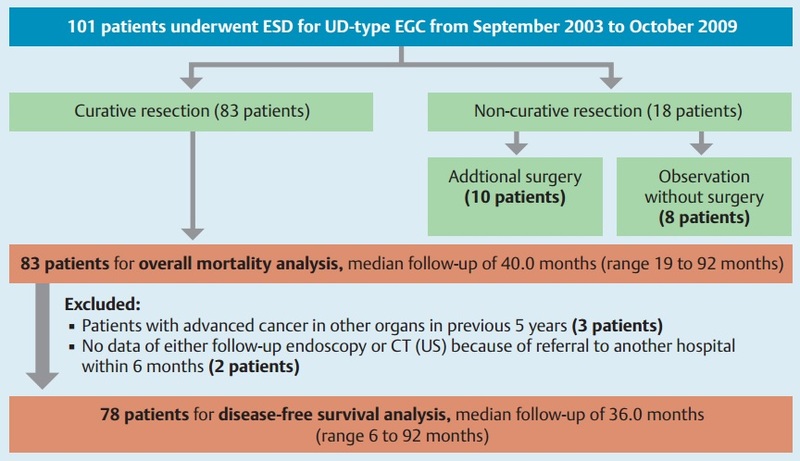 Digest Liver Dis 2013 연세대학교의 위암 ESD 전체가 포함된 논문임. Ref 32. (Choi MH. 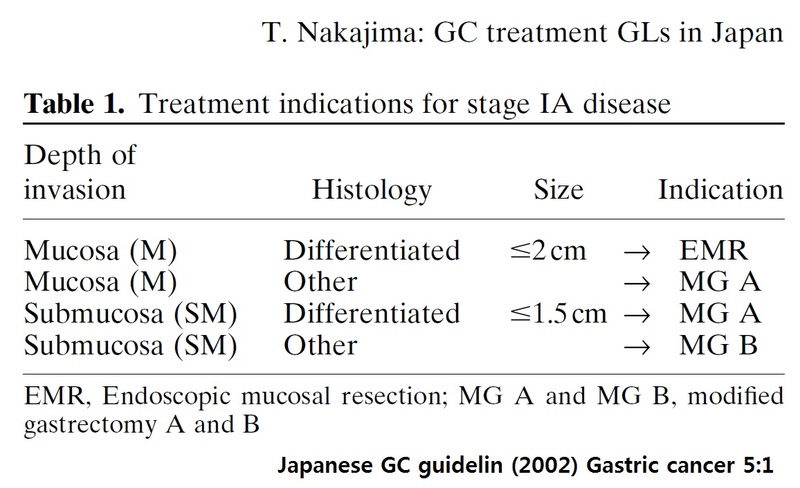 Korean J Gastroenterol 2013). 순천향대학교의 우리말 논문입니다. Mixed type (PD + SRC)이 많다는 것을 밝히고 있습니다. Ref 35. Oka. 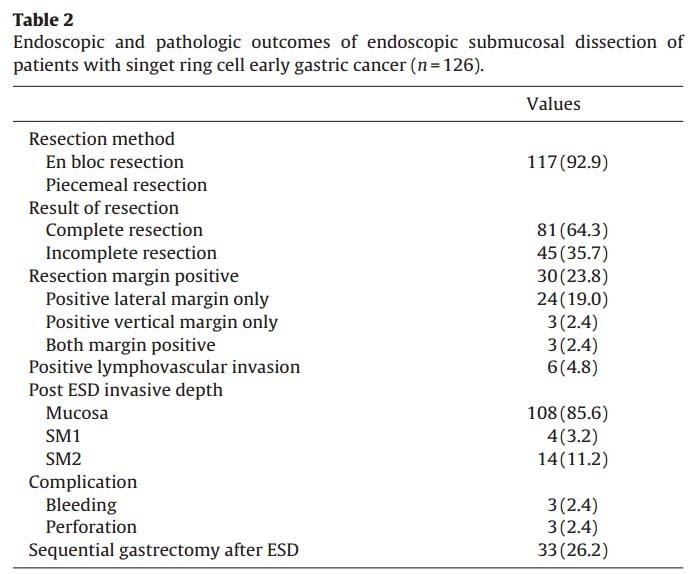 Surg Endosc 2014 ESD와 수술을 비교한 전남대 외과 논문입니다. Ref 36. Oka. 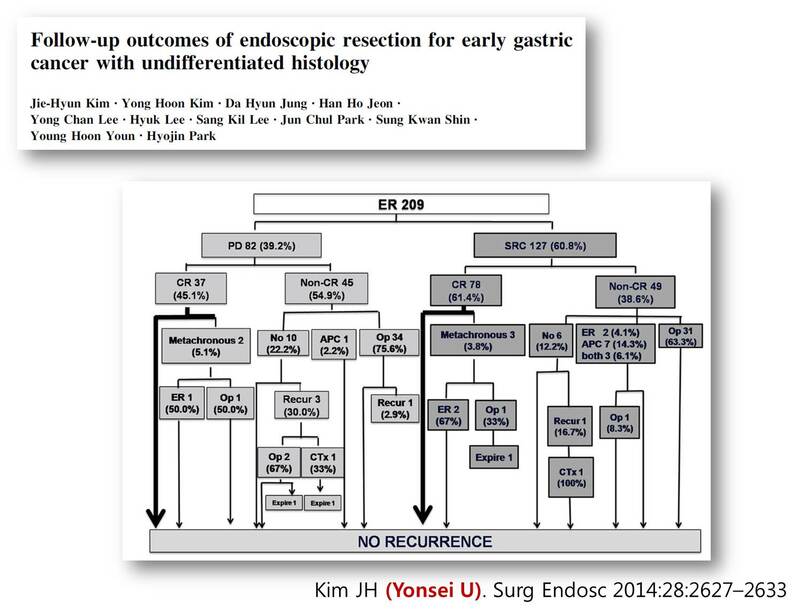 Surg Endosc 2014 히로시마대학 Dr Oka의 매우 솔직한 논문입니다. 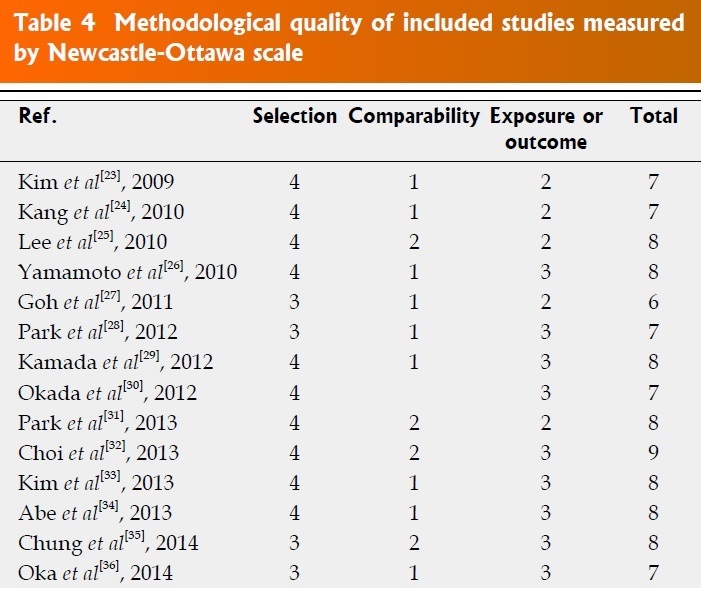 The methodological quality of the enrolled studies was assessed using the Newcastle-Ottawa Scale (Health Technol Assess. 2003, Eur J Epidemiol. 2010. This tool comprises three parameters: the selection of the study population, the comparability of the groups, and the ascertainment of the exposure or outcome. Each parameter consists of subcategorized questions: selection (n = 4), comparability (n = 1), and exposureor outcome (n = 3). The stars awarded for each item allow for a rapid visual assessment of the methodological quality of the studies. A study can be awarded a maximum of nine stars, indicating the highest quality. Two of the authors (Bang CS and Baik GH) independently evaluated the methodological quality of all the studies, and disagreements between the two evaluators were resolved by discussion or consultation with a third author (Kim DJ). 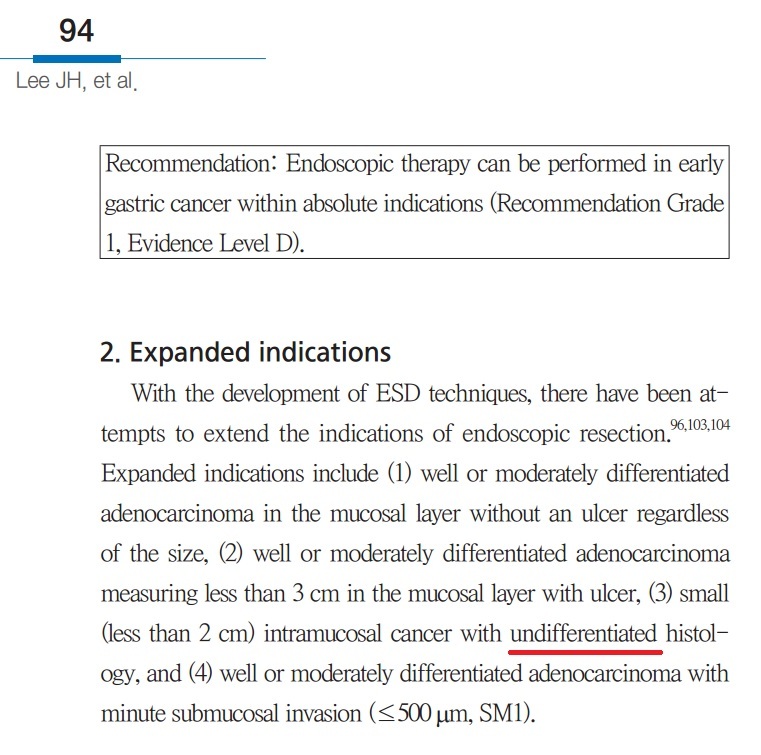 [종설] 2016년 1월 연세대학교 강남세브란스병원 김지현 선생님은 World Journal of Gastroenterology에 "Important considerations when contemplating endoscopic resection of undifferentiated-type early gastric cancer"라는 흥미로운 종설을 발표하였습니다 (Kim JH. WJG 2016). 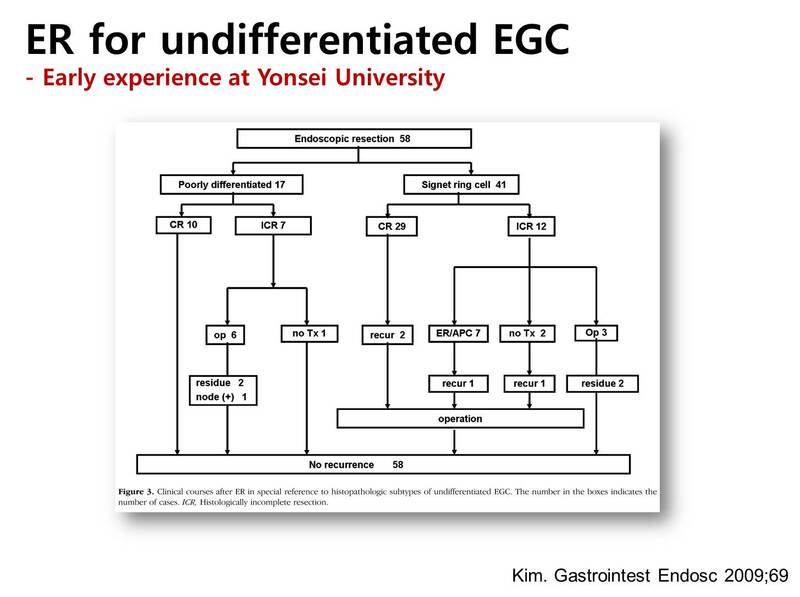 Undifferentiated type EGC를 내시경, EUS, 조직검사로 평가할 때 만나는 어려운 점을 상세히 기술하면서 아래와 같은 도표를 제시하셨습니다. Figure 5. 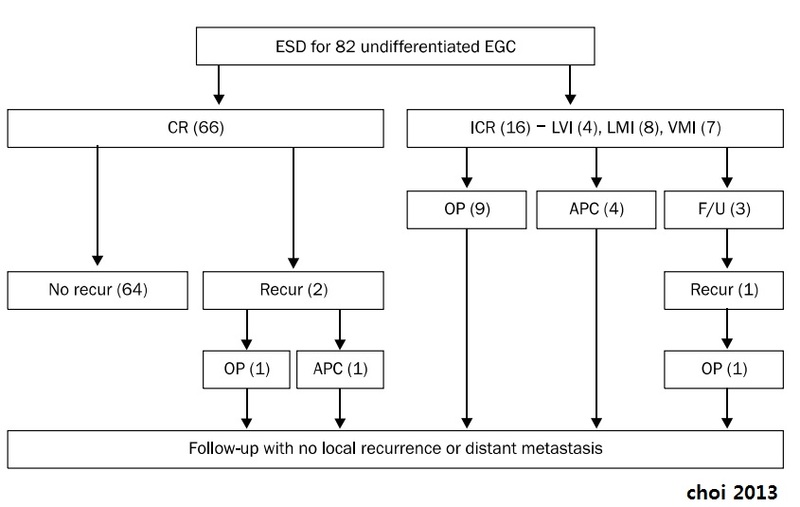 Suggested decision algorithm for endoscopic resection of undifferentiated-type early gastric cancer. 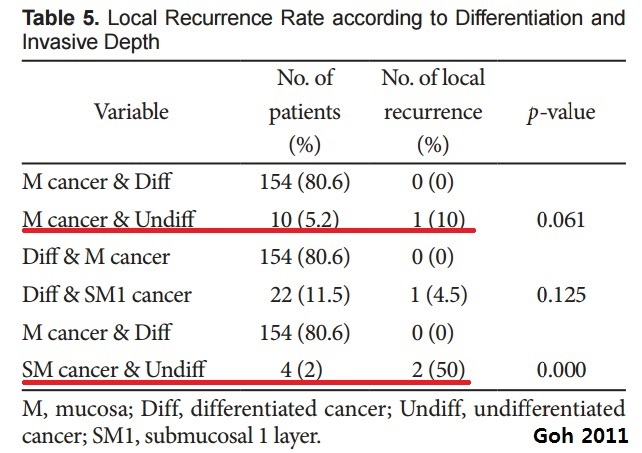 1Biopsy of several peripheral regions may aid in the exact diagnosis of undifferentiated-type histology prior to ER; 2Histologically minimum lateral margins should be wider than 3 mm for curative resection after ER; 3Even when complete resection has been achieved, short-term follow-up endoscopy to detect undifferentiated histology after ER may help to evaluate the risk of residual tumor development. 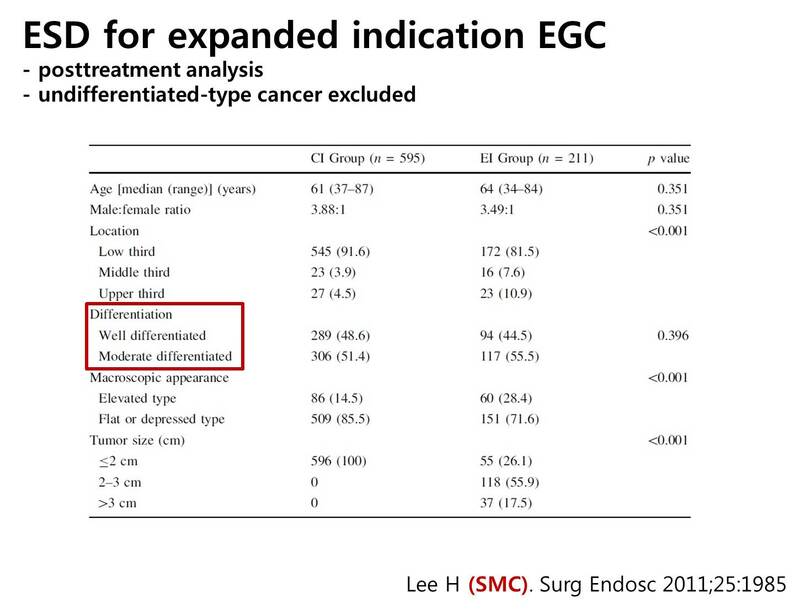 저는 여간해서는 undifferentiated type EGC의 내시경치료를 하지 않고 있습니다. 위 도표보다 훨씬 더 엄격한 기준과 감(感)을 적용하고 있습니다. 여하튼 김지현 교수님의 종설은 많은 중요한 research topic을 제시하고 있다고 생각하였습니다. 김지현 선생님. 좋은 종설 축하합니다. 아직까지 확대적응증에 대한 다수의 연구는 undifferentiated-type은 제외된 상태로 발표되고 있습니다. Undifferentiated-type에 대한 자료만을 분석한 연구는 따로 발표되고 있습니다. 지금까지 undifferentiated-type에 대한 연구는 (1) 후향적 연구이고 (2) 상당수의 환자가 시술 전에는 differentiated-type으로 판단되어 ESD candidate에 포함되어 있으며 (Surg Endosc 2015 (서울대)), (3) 고령이나 동반질환 등으로 인하여 ESD를 선택하게 된 환자가 다수 포함되어 있는 등 selection bias가 많은 편입니다. Selection bias가 없는 연구가 필요하다고 생각합니다. Undifferentiated-type은 한마디로 결론내기는 어려운 것 같습니다. 선생님께서 정말 날카롭게 정리해놓으신 것 같습니다. 1. 말씀대로 대부분 따로 outcomes을 내는 경우가 많습니다. 왜냐하면, undifferentiated-type은 curative resection이 분화암에 비해 확실히 떨어지기 때문입니다. 같이 합쳐서 분석하면 CR rate가 확대 적응증에서 낮아질 가능성이 높기 때문일 겁니다. 이와 같은 이유는 ESD 시술 전 indication에 맞다고 생각하였으나 실제로 떼어보니 넘어간 경우가 많기 때문입니다. 즉, pretreatment prediction (depth of invasion or exact size)이 어렵다 하겠습니다. 이 부분은 분화암과 undifferentiated-type암의 근본적인 cell 자체의 biologic behavior가 다른 것이 이유가 된다고 생각합니다. 2. 선생님께서 잘 설명해주시는 ESD 기준이 ‘치료 전 indication’이자 ‘치료 후 CR criteria’로 같이 사용되기 때문일 것이며, 이것의 discrepancy가 심한 것이 바로 undifferentiated-type이라고 생각합니다. 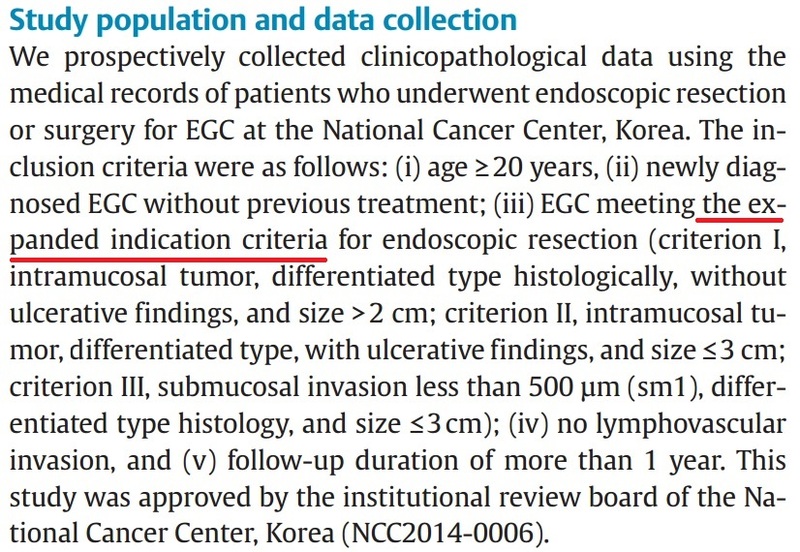 이전에 위암학회 때 어떤 일본 선생님을 만난 적이 있었는데.. 당시 제가 undifferentiated-type EGC의 long-term data를 poster 발표하였습니다. 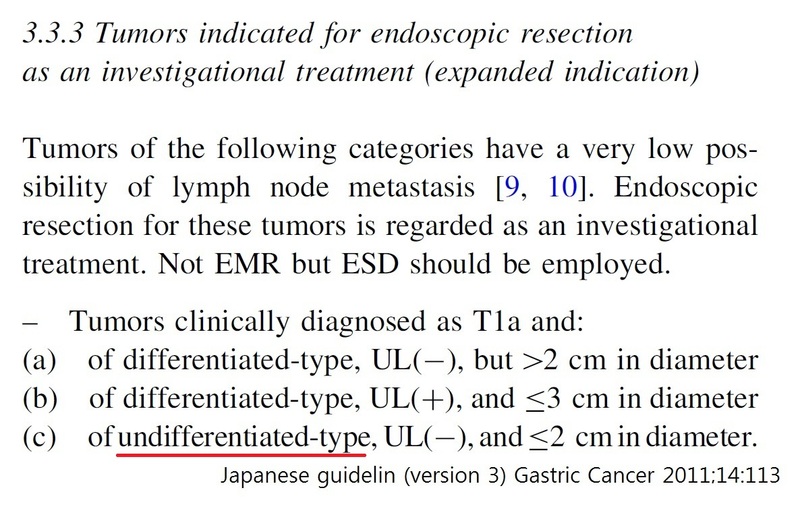 그 일본 선생니은 undifferentiated-type의 경우 ESD 전 size 기준을 1cm으로 한다고 합니다. 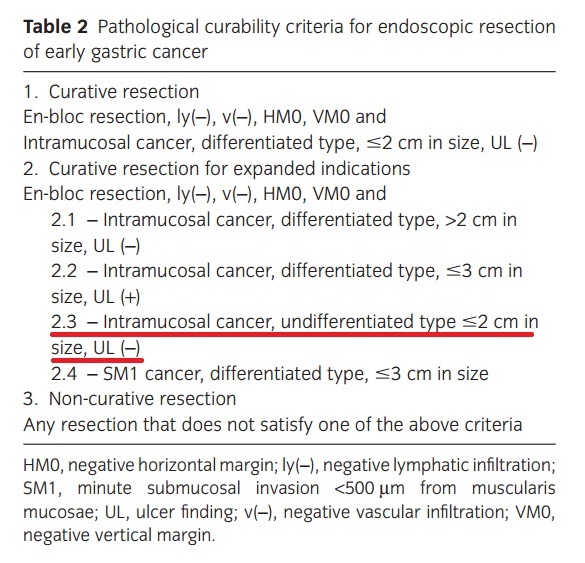 이렇게 생각하고 ESD 하여야 2cm 기준인 CR criteria에 맞는다는 것이지요. 3. 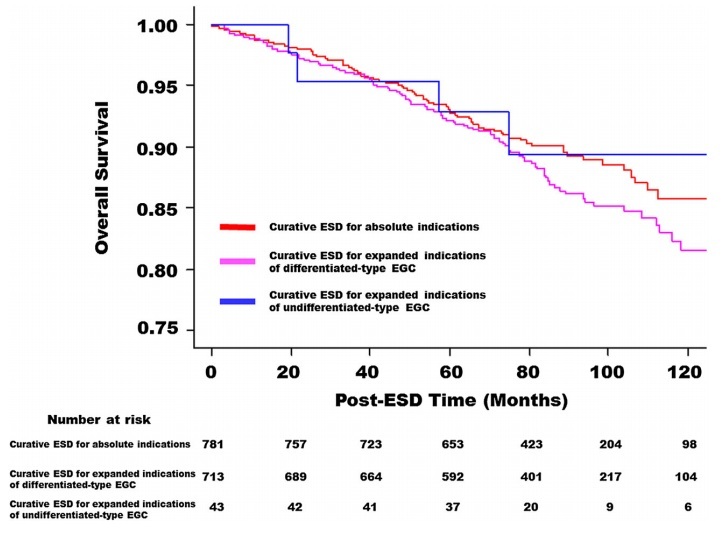 Undifferentiated-type에 대한 ESD 결과에서 CR만 된다면 그래도 clinical outcome은 좋다는 결과를 가지고 ESD를 시행하는 rationale로 삼고 있습니다. 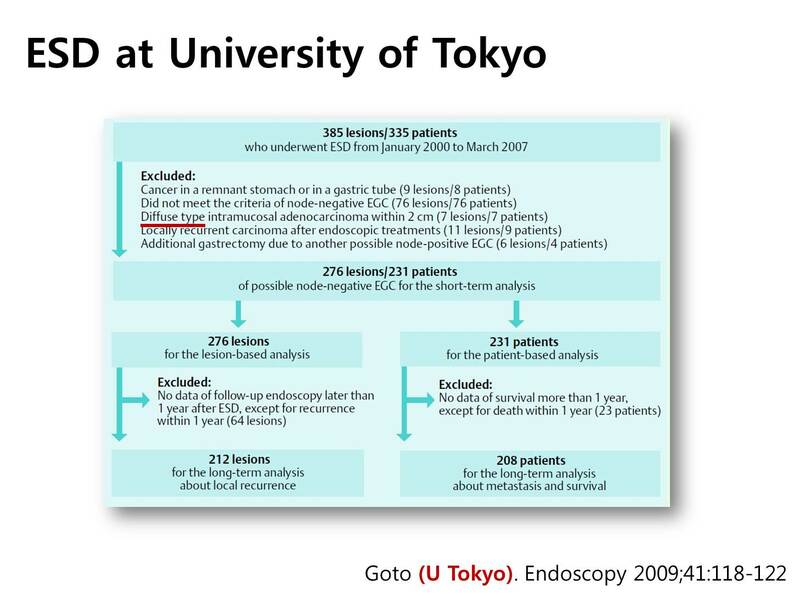 다만, 시술에 대한 endoscopist의 strict 기준과 분화암과는 다른 biology를 가짐을 명심하고 approach하는 것이 중요하다고 생각합니다. 4. 같은 undifferentiated-type이지만 poorly와 signet ring의 특성이 다른 만큼 undifferentiated-type은 어렵고 dynamic 한 것 같습니다. 하지만, 신기하게도 curative하게만 치료되면 outcome은 두 세포 type이 비슷한 것 같습니다. Curative하게 접근하기까지 두 cell type이 다른 것 같지만요. Brief history of expanded를 포함하면 좋을 것 같다. Expanded indication에 따라 환자를 선정하였다고 말하는 논문이 많지만 믿기는 어렵다. 최종 병리결과를 보고 역추적한 내용이 아닌가 추정된다. Indication이라고 한다면 그에 해당하는 환자는 일단 내시경 치료를 해야 옳지 않은가? 그렇지 않은 환자가 매우 많다. Selection bias가 매우 심할 것 같다. 따라서 curative resection이 되면 예후는 좋다고 결론짓는 것은 상당히 조심스럽다. 이러이러한 조건하에 curative resection되면 좋다고 말하는 것이 옳지 않을까? 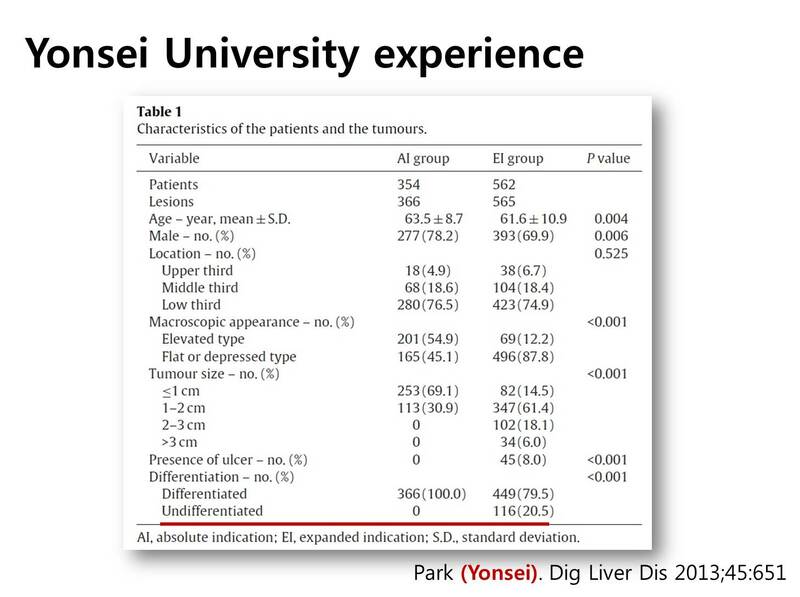 Pathology를 보고 환자를 골랐다고 한다면 어디서는 LV 등을 포함한 것 같고 어디서는 안 포함한 것 같다. 수술하지 않은 환자가 상당히 많다. 이들에 대하여 어떻게 되었는지가 중요하다. 이들에 대한 follow up 기간이나 drop out rate등이 임상적으로 의미가 있을 것 같다. 재발할 것 같은 환자는 자세히 검사되지 않고 재발하지 않을 것 환자만 장기 관찰하는 것이 무슨 의미가 있을까? 심충섭 선생님의 treatment algorithm을 좀 더 다듬어야 할 것 같음. Histological heterogeneity: 삼성서울병원처럼 분화형과 미분화형이 섞여 있을 수 있고, 순천향병원처럼 P/D와 SRC가 섞여 있을 수도 있습니다. 연구마다 P/D와 SRC의 ratio가 매우 다릅니다. Selection bias가 심하다는 것을 알 수 있습니다. Disgnostic group classification이 병원 진료 스타일에 따라 크게 다르다. 즉 undifferentiated를 상당히 많이 포함하고 있는가 하면 매우 적게 포함하는 곳도 있다. 2) Ahn. 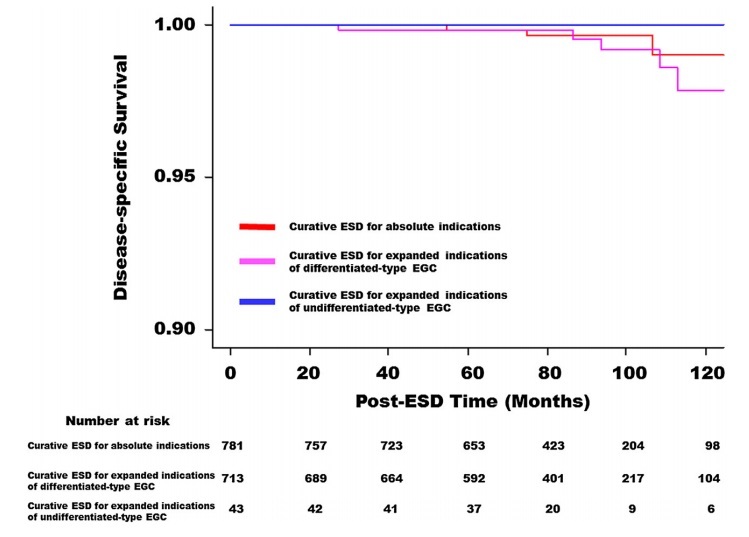 Long-Term outcome of extended ESD for EGC with differentiated histology. - 2013년 서울아산병원 안지용, 정훈용 선생님의 종설입니다. Expanded indication (저자들은 extended indiction이라는 용어를 사용하고 있습니다)에 대한 지금까지 임상연구의 성적은 좋으나 최근 surgical data의 상세분석에서 림프절 전이의 위험이 제기된 점, ulcer에 대한 관찰자간 차이를 고려해야 한다는 점 등이 명료하게 설명되었습니다. Undifferentiated에 대한 설명은 없습니다.